ABSTRACT: In the course of the introductory commentary on hypermeter in A Generative Theory of Tonal Music (GTTM), Lerdahl and Jackendoff discuss the opening measures of Mozart’s Symphony No. 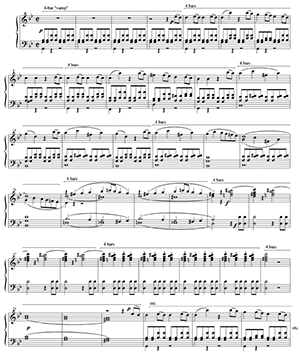 40 in G Minor, a hypermetrically ambiguous passage in which “the performer’s choice . . . can tip the balance one way or the other for the listener.” Through reflections on concepts from more recent psychological inquiry into performance, and on the interpretations of the passage that are projected in four well-known recordings of the Symphony, I will develop a set of theoretical principles that describe the “balance-tipping” effects of performance-specific elements on hypermetric structures inferred by the listener. This special case will lead to a more general reconsideration of the place of performance in the design of the Lerdahl-Jackendoff theory. The article proceeds in five parts: (1) an introduction to the main theoretical concepts to be discussed, including a brief consideration of current debates with which the study intersects; (2) a critical discussion of the relationship between hypermeter and performance that is proposed in GTTM; (3) an attempt at extending the theory of accent types to include a special class of phenomenal accents that is under the performer’s control; (4) a close reading of four recordings, facilitated by quantitative performance analyses, and an attempt at explaining their hypermetric patterns as transformations of perfectly regular underlying structures; and (5) concluding remarks of a more general nature on the relationship between structure and performance in GTTM. Both of these definitions allude to music perception, and the distinction between them might be understood to reflect a shift in the orientation of music perception research that occurred in the 1980s. Traditionally, perception was understood as the relatively passive mental reproduction of a given physical stimulus, but it is now generally considered to be an active, constructive (as opposed to reconstructive) process. (4) The revised definition of meter might also be understood against the backdrop of a similar, though perhaps more gradual, paradigm shift in music theory and in music scholarship generally. Largely in response to far-reaching methodological and ideological critiques, notably Joseph Kerman’s Contemplating Music and subsequent work by postmodernists and gender theorists, we seem to have become increasingly skeptical of the objectification of musical works and the quasi-taxonomic interpretation of their elements. (5) In this light, it seems especially appropriate that today’s theorists should emphasize the subjective contingency, as opposed to the autonomy, of meter. [1.2] In the present article, I will explore some of the theoretical and analytical ramifications of the recent reconceptualization of meter, especially the effects of performing nuance on meter perception. I will take as my point of departure the discussion of the interaction of meter and performance in Fred Lerdahl and Ray Jackendoff’s A Generative Theory of Tonal Music (GTTM). (6) I have chosen this text for several reasons. First, GTTM has proven to be among the most convincing sustained exercises in psychologically informed music theory. (7) Second, it has been highly influential among theorists interested in meter and among music psychologists interested in performance, so it can be seen as a well-established link between the literatures on which I will draw. (8) Third, the language of GTTM is extremely clear, and the theory’s methodological foundations and orientation have been explained thoroughly. (9) For example, the authors introduce the theory as an attempt to capture in formal language “the musical intuitions of a listener who is experienced in a musical idiom,” rather than aspects of the composer’s intentions or intrinsic properties of musical works. (10) Furthermore, the authors are frank about the theory’s shortcomings, thus reminding the reader that GTTM is incomplete and suggesting that it has room for expansion and refinement. (11) Fourth, the passage from GTTM that I will take as my point of departure is related to three topics that have remained controversial during the nearly two decades since the publication of GTTM. These include discussions on the interrelationship between musical structure and performance, on the epistemological foundations for comparing different performances of the same piece, and on the degree to which hypermeter can be irregular. (By “hypermeter,” I mean the projection of a pattern of strong and weak beats across units larger than one measure. (12)) Of these three controversial topics, I will say most about the third, but I would like to offer a few remarks on the first two issues at the outset. [1.3] Commentaries on the relationships between musical structure and performance form an increasingly prominent genre in the literature of music theory. (13) In a recent critique of the rhetoric most often employed in this genre, and in music analysis generally, Nicholas Cook draws attention to the dogmatic, prescriptive tone that is typical of analysts’ suggestions to performers. (14) As an alternative, Cook recommends that we strive for a more balanced dialogue in which neither the analyst nor the performer is considered to have the upper hand. By invoking J. L. Austin’s theory of speech-acts, Cook proposes that we might begin to read analyses not only as truth-claims (which Austin terms “constative utterances”) but also as acts of persuasion (“performative utterances”), thus highlighting a deep similarity between musical performance and analytical writing. (15) Building on earlier polemics by Tim Howell and Lawrence Rosenwald, Cook also encourages analysts to listen to performances and recordings and to make descriptive, as opposed to prescriptive, remarks on the relationships between structure and performance. (16) In another recent essay, Joel Lester demonstrates this strategy convincingly by showing parallels between various recordings and analyses in the case of structurally ambiguous passages. For example, Lester shows how two different analytic perspectives on a Mozart minuet correspond to details in recordings of the piece by Lili Kraus and Vladimir Horowitz. (17) I will adopt a similar discursive strategy in my readings of hypermeter in the opening of a Mozart symphony by showing structural models that seem to fit best with the nuances of four different recordings, but I will also go further and explore in purely theoretical terms how we might begin to account for the diversity encountered in a comparison of diverse performances. [1.4] An important methodological question faces those of us who would like to theorize the interrelationships of performance and structure, and in particular the effects of different performances on the listener’s perception of structure: what is the conceptual framework within which comparisons between performances can be made at all, that is, how can we account (in theoretical, as opposed to historical or stylistic, terms) for the differences that we encounter in comparative listening? At one extreme, scholars who aspire to positive knowledge, who contend that we should aim for a single, comprehensive analysis of any work, might be expected to evaluate the quality of a performance on the basis of the convincingness of the analysis that it seems to reflect and to consider the differences between performances to be a result of differences between performers’ levels of insight. (18) At the other extreme, those who have embraced pluralism and liberalism would, on principle, question the validity of any theory that encourages positivistic thinking, and might instead attribute differences between interpretations to the diverse and unpredictable personal and cultural contexts of each performance. (19) My own approach lies somewhere between these two extreme positions, because I would like to bypass certain methodological obstacles latent in each: the former paradigm (which we might call the positivist “competition” model) is inconsistent with our ability to recognize two very different performances of the same work to be more-or-less equally convincing, and the latter (which we might call the pluralist “free-for-all” model) seems too broad to be commensurate with the project of discussing differences between performances primarily in terms of the perception of structure. [1.5] My approach is based on a third paradigm, which I call the “alternative stabilization” model of performance comparison. This paradigm will allow me to theorize the differences between performances in structural terms, but to do so without privileging one performance over the others. At this point, I will describe its premises in only the most general and practical terms. When analyzing a work through reading it from the score, one sometimes encounters genuine ambiguities, passages in which some aspect of the structure perplexingly eludes a single preferred interpretation. (20) In listening to performances and recordings, however, much more information is available than would be found in the score alone. As Nicholas Cook recently reminded us, scores are not only potential objects of analysis, but also function as “scripts” in many of the social contexts in which notation is sounded out—scripts to which a performance serves as a sort of supplement. (21) I am interested in situations in which this supplement removes, or at least reduces, the degree of ambiguity encountered in reading the score, such that the listener is unaware of the ambiguity, or at least less inclined than the reader to describe the structure in question as ambiguous. The performer must choose only one of the possible interpretations, so naturally performances can be compared to one another regarding the choices made by performers. (22) In the case of works or passages for which multiple versions exist in notation (e.g., “ossia” passages in Romantic piano music) or for which there is a pronounced improvisatory element (e.g., Corelli’s slow movements, jazz), this stabilizing effect is perhaps most obvious. (23) In the case of hypermeter, however, it is not the notes that are chosen, but rather the subtle expressive nuances of a performance, including details of timing, dynamics, and timbre, that provide the stabilizing effect. [1.7] Contrary to popular belief, the leading exponents of Gestalt psychology did not base their research on the cliché, “the whole is greater than the sum of its parts.” Rather, they claimed that the perception of the whole is categorically different from a summation of perceived parts. (27) Max Wertheimer was the first psychologist to argue that percepts are not put together piecemeal but rather are understood intuitively and immediately according to basic aesthetic principles, such that one should proceed from the whole to the parts rather than the reverse in any attempt to theorize perception. (28) Wertheimer’s most basic principle is the “Law of Prägnanz [precision],” which was most clearly expressed by his colleague Kurt Koffka: “Psychological organization will always be as ‘good’ as the prevailing conditions allow. In this definition the term ‘good’ is undefined. It embraces such properties as regularity, symmetry, simplicity, and others which we shall meet in the course of our discussion.” Some of these “others” include “unity, uniformity, good continuation, simple shape, and closure,” all of which are discussed at some length in Koffka’s encyclopedic Principles of Gestalt Psychology. (29) Lerdahl and Jackendoff explain that the Law of Prägnanz is closely associated with their Preference Rules (PRs), whose main purpose in GTTM is to capture the sense of stability associated with the hierarchical organization of tonal music. (I will have more to say on PRs below.) In fact, they claim that “the preference rules in effect constitute an explicit statement of the Law of Prägnanz as it applies to musical perception.”(30) The intricacies of perceptual stability and instability are perhaps best illustrated in the work of the Edgar Rubin and his circle, who are remembered for their studies on the perception of ambiguous visual stimuli. [1.8] A few variations on Rubin’s famous “faces/vase” drawing will serve as a first attempt at a visual analogy for what I have termed the alternative stabilization phenomenon (Example 1(31)). Let us say we have a score in which two interpretations of the location of a phrase boundary seem equally tenable to the reader. This experience is a bit like looking at Rubin’s drawing (Example 1a) and being unable to decide whether it depicts two faces or a vase. The location of the phrase boundary might be less ambiguous from the listener’s perspective, however, because performing nuances, like a few embellishments to Rubin’s drawing, can increase the perceptual stability of either interpretation (see Example 1b–c). 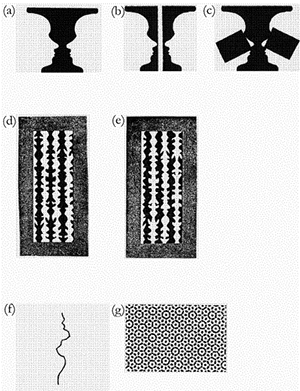 Another visual analogy, which uses a subtler manipulation and also eliminates the representational component of the drawing, thus bringing the analogy closer to GTTM (a formalist theory), comes from the work of Rubin’s student Paul Bahnsen, who examined the perceptual effects of the shape of the border between alternating black and white regions. Perception might be expected to be unstable when all borders are parallel or all borders are irregular, but it is highly stable when borders of either the black or white regions are symmetrical (as in Example 1d–e). This might be seen as an analogy for the projection of phrase boundaries through the use of “phrase rubato,” which (perhaps coincidentally) is itself symmetrical, for the performer typically begins the phrase relatively slowly, accelerates to the climax, and decelerates at the end of the phrase. (32) I should add that some ambiguous figures, like some musical passages, have more than two possible interpretations. For instance, a single curved line (Example 1f) might be seen as the border of a figure to the left, the border of a figure to the right, or simply a line superimposed on a continuous background. This line is referred to as a “tristable” figure, since it can be interpreted in three different ways. Still more extravagant is the ambiguity found in some multistable mosaic patterns (Example 1g). I will leave it to the reader to imagine some manipulations that would stabilize patterns like Example 1(f) and (g). [1.9] We are now ready to explore some of the ways GTTM might be developed to account more fully for the impact of performance on the listener’s experience of hypermeter. In Part 2, I will examine Lerdahl and Jackendoff’s position on this subject, which appears in the context of an argument against the perception of irregular hypermeter. In Part 3, I will attempt to revise the classification of accent types in GTTM to include a category that I call “Phenomenal Micro-accents” (PMs) and discuss the importance of these accents in the case of otherwise unstable metric and hypermetric structures. In Part 4, I will present analyses of hypermeter in the opening measures of Mozart’s Symphony No. 40 in G Minor in four different recordings and illustrate the stabilizing effects of their different patterns of PMs, and I will also develop formal transformation rules that model the listener’s ability to hear the irregularities in these patterns as modifications of an inferred, perfectly regular metrical pattern. Finally, in Part 5, I will offer a more general critique of Lerdahl and Jackendoff’s position on the relationship between performance and their analytic process, and I will also identify some avenues for further research. [2.1] In GTTM, the term “Metrical Structure” (MS) refers to accent patterns within the measure (sometimes called “bar meter”) as well as meter-like organization across spans smaller than measures (i.e., quasi-metric subdivisions of beats) and larger than measures (i.e., hypermeter). (33) In Lerdahl and Jackendoff’s ingenious notational system for MS, a dot under the score represents the point in time corresponding to a beat, and the number of dots in a given column indicates the accentual strength at that point relative to other beats in the hierarchy. (34) Their analysis of the opening of a Beethoven scherzo (Example 2(35)) demonstrates this system well. The local triple meter is shown by the presence of a dot at level (b) under every third dot at level (a). Three levels of hypermeter, all duple, can be inferred by comparing the dots of the remaining pairs of adjacent levels in the example. Levels (b) and (c) show five two-bar hypermeasures, (c) and (d) show two full four-bar hypermeasures, and levels (d) and (e) show a single full eight-bar hypermeasure. For simplicity, I will refer to hypermetric levels by number, with H1 being the first level of hypermeter, H2 the second, and so on. [2.2] Each of the four main components of GTTM (of which MS is one) is governed by two sets of rules. The practice of developing rule systems stems from the system of transformational linguistics developed by Noam Chomsky, Jackendoff’s mentor. (36) These rules are supposed to model the largely automatic cognitive processing by which musical surfaces are parsed. Many of the principles formalized in the Rule Index of GTTM come from Gestalt psychology and from more recent research in music perception. Preference Rules (PRs) are designed to capture the way experienced listeners interpret a unique combination of structural details. (37) As mentioned above, PRs are concerned mainly with clarifying perceptual stability, and they are applied to each piece ad hoc after the more general constraints captured by Well-Formedness Rules (WFRs) have been applied. Metrical Well-Formedness Rules (MWFRs) determine the number of levels and their patterns of strong and weak beats, while Metrical Preference Rules (MPRs) encourage the most logical alignment of this pattern with events at the musical surface such as dynamic accents, long notes, and cadences. Example 3. Two interpretations of hypermeter in Mozart, Symphony No. 40 in G Minor, K. 550, I, mm. 1–20. [2.5] Although the variability of performance provides Lerdahl and Jackendoff with a pragmatic objection to irregular hypermeter, and consequently to deep levels of hypermeter in most contexts, it is not clear that this difficulty amounts to a theoretical impasse. 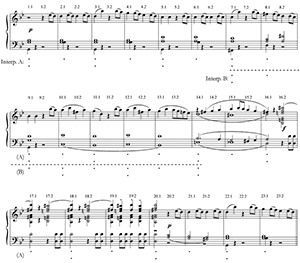 I would suggest that most experienced listeners­apparently including Lerdahl and Jackendoff themselves­perceive some degree of quasi-metrical organization in the Mozart excerpt shown in Example 3 across spans larger than one measure. In order that the theory might better capture the experienced listener’s intuitions, I consider it worthwhile to develop in formal terms the “balance-tipping” effect that Lerdahl and Jackendoff mention. Clearly, irregular hypermeter is more complex than regular hypermeter, and thus more difficult to formalize, but it seems to me that this complexity ought to be confronted rather than avoided. In particular, I would argue that the degree of hypermetric irregularity typically encountered in performances of the Mozart excerpt is not so extreme as to obviate any sense of hypermeter; this excerpt seems to lie in the vast “grey area” between regular and random proportions, between the obvious and the incomprehensible. [2.6] Gestalt psychology again provides a useful analogy. According to one interpretation of the Law of Prägnanz, the purpose of the act of perception is to simplify or regularize the information given in the stimulus if it is possible to do so (Example 4). (44) Thus, a perfectly regular shape such as the one shown in Example 4a may be altered to some degree, as in Example 4b–c, without causing the lack of integrity found in a random collection of line segments, such as Example 4d. This very principle enables Lerdahl and Jackendoff to explain away the subtle durational irregularities found at the beat-to-beat level in performance; they note that listeners are able to infer a regular pulse underlying a musical surface transformed through tempo rubato. (45) They do not, however, explore the functioning of this type of manipulation at the level of the measure or hypermeasure, and the reason for this again seems to be a practical rather than a theoretical problem, namely, how to determine with precision what should be included in the inferred metrically regular musical surface that preceded the transformation. [2.7] In the formal language of GTTM, the phenomenon I am describing could best be captured through a series of “transformational rules.” This category of rules, which is separate from the WFRs and PRs, is loosely based on grammatical transformations such as the change from active to passive voice or from present to past tense. (46) The transformational rules in GTTM reverse the changes to the musical surface brought about by processes like phrase overlapping and elision. (47) In order to adhere to this notationally oriented practice, our transformational rules for hypermetric irregularities would need to be able to generate entire measures of inferred music. In an earlier attempt at applying Chomsky’s principle of grammatical transformation to music, Leonard Bernstein did just that: he recomposed the opening of Mozart’s Symphony No. 40 in such a way that regular metrical structures are found at levels H1 and H2, that is, hypermeter at the level of the double- and quadruple-measure (Example 5(48) and accompanying Audio(49)). Bernstein’s newly composed material (measures 1–3, 15–16, 19–20, 23–24, 28–31, and 34–36) amounts to sixteen additional measures, making it two-thirds longer than the passage on which it is based. Lerdahl and Jackendoff claim that this type of approach is untenable, because it is too “hypothetical,” by which I think they mean too far removed from the actual listening experience, and because it is so arbitrary in its details. While I agree with this assessment, I nevertheless find Bernstein’s approach thought-provoking. As I mentioned near the beginning of this paper, meter is now regarded primarily as a construct created by the performer and listener, rather than an inherent and fully determined property of a musical work or score. One property of this construct appears to be that, once formed, it can be separated substantially from the musical surface. For instance, once we know a piece, we can imagine or even physically “feel” its metrical pattern without also imagining other parameters, such as the pitch materials. Indeed, psychologists have found empirical support for the human cognitive ability to form abstract, hierarchical mental representations of musical meter, and this finding seems highly compatible with Lerdahl and Jackendoff’s MS theory and its associated analytic notation. (50) In my view, then, it should be sufficient to show the transformation of irregular hypermeter in an abstract sense rather than proposing transformations at the level of the musical surface. The schematic representation of MS in a given passage can easily be compared to a hypothetical, perfectly regular MS, and processes like metrical expansion and truncation can be reversed. (51) For instance, it is clear that both of the MS interpretations of the Mozart example that Lerdahl and Jackendoff offer (see Example 3) contain a single three-bar hypermeasure amid a stream of two-bar hypermeasures. A transformational rule to regularize this pattern, thus modeling the simplifying function of the Law of Prägnanz in this context, would merely need to reverse this metrical expansion. (I will propose such a rule below; see paragraph 4.6.) The location of the departure from the regular pattern will depend on the performance, but we will nevertheless hear it as a departure from something that is more-or-less regular, stable, and comprehensible. That “something” is the underlying hypermeter. [2.8] It is tempting to accuse Lerdahl and Jackendoff of succumbing to the influence of an insidious aesthetic bias, the so-called “autonomy ideology,” on the grounds that they are reluctant to formalize the dependency of an analysis on a specific performance. That is, one could speculate that their “balance-tipping” analogy (see the passage from GTTM quoted in paragraph 2.4) is abandoned in their theoretical discussion because it is incommensurable with contemplating the inner workings of an autonomous (i.e., radically independent) musical work. This accusation would be unfair, however, given that Lerdahl and Jackendoff explicitly avoid the discussion of aesthetics; in subsequent publications, they have repeatedly pointed out that GTTM theorizes aspects of the comprehensibility of a work, not its aesthetic qualities, and that these two parameters are not always closely related. (52) GTTM might be regarded as a method for developing the simplest interpretation of a tonal work’s hierarchical dimensions, for bringing the interpretation as close to the Gestalt ideal of “good form” as possible, such that a GTTM-style analysis can be thought of as representing structural intuitions that operate on the most perceptually “stable” events in a piece of tonal music. In other words, although it is a formalist theory, it attempts to escape idealism and instead to account for musical intuitions in terms of psychological principles drawn mainly from the work of the Gestalt school. (53) In this light, it would seem most appropriate to object to the abandonment of the balance-tipping model on the grounds of the Law of Prägnanz (see paragraph 1.7), rather than an aesthetic bias. (54) As we have seen, this law begins, “Psychological organization will always be as 'good' as the prevailing conditions allow.” I would argue that the limiting factor­the “prevailing conditions” alluded to in this definition­should at least potentially include all of the information contained in the aural stimulus, including features specific to an individual performance. The main obstacle to developing Lerdahl and Jackendoff’s balance-tipping model would therefore seem to be not an ideological conflict but rather the practical difficulty of describing the elements of a performance with adequate precision. [2.9] It has long been recognized that the projection of a structural interpretation is one function of the expressive nuances that performers add in their realizations of scores. These nuances are sometimes termed “systematic variations” (abbreviated SYVARs), because they can be described in quantitative terms as patterns of departures from mechanical regularity in a given domain, such as speed or loudness. (55) In the case of an unambiguous structure, it would be relatively unproblematic to assume a direct, linear connection between the score and the “musical surface” (i.e., the aural presentation of the music), so long as the hypothetical performer adheres to the same SYVAR conventions that the listener has absorbed through aural experience with the musical idiom (see Example 6a). In such cases, the absence of PRs pertaining to performing nuances in the rule index of GTTM seems unproblematic; in a conventional performance, structural interpretations are projected rather than obfuscated or contradicted. (56) In the case of an ambiguous structure, however, the musical surface that is presented to the listener is often much clearer than the score itself. 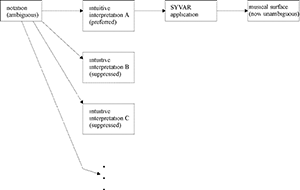 (57) It should follow that, in the case of ambiguous structures, the role of the performer’s interpretive preference, as expressed through SYVARs, deserves some consideration (see Example 6b–c). The fact that these SYVARs cannot be predicted definitively on the basis of a score makes them no less relevant to a theory of the listener’s intuitions. In our judgment it is essential to distinguish three kinds of accents: phenomenal, structural, and metrical. By phenomenal accent we mean any event at the musical surface that gives emphasis or stress to a moment in the musical flow. Included in this category are attack points of pitch events, local stresses such as sforzandi, sudden changes in dynamics or timbre, long notes, leaps to relatively high or low notes, harmonic changes, and so forth. By structural accent we mean an accent caused by the melodic/harmonic points of gravity in a phrase or section­especially by the cadence, the goal of tonal motion. By metrical accent we mean any beat that is relatively strong in its metrical context. . . Phenomenal accent functions as a perceptual input to metrical accent­that is, the moments of musical stress in the raw signal serve as “cues” from which the listener attempts to extrapolate a regular pattern of metrical accents. If there is little regularity to these cues, or if they conflict, the sense of metrical accent becomes attenuated or ambiguous. If on the other hand the cues are regular and mutually supporting, the sense of metrical accent becomes definite and multileveled. Once a clear metrical pattern has been established, the listener renounces it only in the face of strongly contradicting evidence. . .
[3.3] The effects of phenomenal accents on metrical accents are formalized as MPRs 4–5, which address relative stress (i.e., loudness) and length, respectively. (61) All the loudness- and length-related accents shown in their exemplars for these rules occur at the rather blatant level that notation can capture, but I will argue that such accents also occur on a much subtler scale in skilled performance. I will call the latter expressive details dynamic and agogic micro-accents (DMs and AMs), or collectively, phenomenal micro-accents (PMs). In general, their effect on listening should be expected to be rather weak owing to their small scale, but as Lerdahl and Jackendoff demonstrate in the case of the Mozart excerpt, PMs can become extremely important in cases where notational clues offer insufficient support for a single preferred reading. In a sense, AMs seem to be incommensurable with MWFR 4, which states that beats must be evenly spaced. As I mentioned, however, Lerdahl and Jackendoff do acknowledge that even spacing is easily inferred in the case of performances made uneven by expressive timing. (62) I would agree that listeners do seem to “correct” the unevenly spaced beats in expressive performance, but, unlike Lerdahl and Jackendoff, I would draw attention to the fact that important information is communicated in the discrepancy between the actual sounding event and the evenly spaced abstraction. [3.5] Additional empirical studies conducted by both Sloboda and Clarke confirm that experienced listeners can identify the meter intended by the performer in the case of the ambiguous melodies used in their performance experiments, so PMs would seem to be a key to the understanding of each performer’s conception of meter in any metrically ambiguous passage. (65) Although the purpose of these experiments was to determine principles for the effects of notation on performance, not to theorize the impact of performance cues on the listening experience, these results are nevertheless relevant to our listener-oriented theory of meter and hypermeter. All that is needed is a reversal of orientation. By cross-referencing the SYVARs in a given performance with the conventions for projecting meter, we should be able to infer the performer’s metrical interpretation of a passage. Among the SYVARs that Clarke and Sloboda identify are dynamic stress and lengthening, which I discussed above in the context of Lerdahl and Jackendoff’s MPRs 4–5, as well as the lengthening of the upbeat. (66) I will distinguish downbeat lengthening from upbeat lengthening by referring to the former as “elongation-style” and the latter as “hesitation-style” AMs. Hesitation-style AMs appear to be unrelated to any of the existing MPRs and even seem to contradict MPR 5(a), which states: “Prefer a metrical structure in which a relatively strong beat occurs at the inception of . . . a relatively long pitch-event.”(67) Thus, I consider it the weakest of the three classes of PMs relevant to ambiguous cases of MS. Nevertheless, its systematic use is well documented in Sloboda’s and Clarke’s experiments, and I believe it is widely understood by listeners, so it ought to be reflected in an MPR. Therefore, I will propose the following addition to the Rule Index in GTTM: MPR 5.5 (Hesitation): “Weakly prefer a metrical structure in which a relatively strong beat occurs immediately after a relatively long pitch-event.” (This rule is included in my Appendix 1, “Revised Rule Index for Metrical Structure.”) Assuming that these PM cues (i.e., DMs and the two classes of AMs) might also operate at levels somewhat deeper than surface meter, we now have the theoretical principles needed to assess whether experienced listeners can be expected to infer hypermetric interpretations other than the two predicted by GTTM in the case of the opening of Mozart’s Symphony No. 40 in G Minor. [4.1] A summary of the techniques that I use for performance analysis is included as Appendix 2. Essentially, I convert the desired excerpts into sound files and analyze the timing and loudness with audio editing software. I should emphasize that I have made no attempt at an inductive statistical analysis of these performances, that is, to use raw quantitative data as “input” and propose qualitative judgments as “output.” Instead, I prefer to use empirical data selectively (though hopefully not too selectively) in order to articulate qualitative PM judgments and comparisons arrived at through careful listening. I begin the performance-analytic procedure with close listening in order to avoid attributing importance to distinctions that are too fine for the ear to detect under normal listening conditions. Quantitative performance analysis is extremely useful in supporting and refining many observations, and it also facilitates detailed inter-performance comparisons. Like other forms of music analysis, quantitative performance analysis seems helpful in sharpening one’s sensitivity to fine nuances­in this case to gradations of intensity and duration. [4.2] In GTTM, beats are considered durationless points in time inferred from the musical stimulus. The acoustical correlate to the beat is the onset, or attack point, of a tone that is understood to articulate the beat in question. When we speak loosely of the duration of a beat, we are really talking about the interval between beats, and the corresponding acoustical measure is the inter-onset interval (IOI). Similarly, when we speak of the loudness of a beat, we are describing the loudness of some sound within the IOI whose onset corresponds to the beat in question. The acoustical correlate of beat loudness is the peak amplitude within an IOI, also known as the peak sound level (PSL). When a beat is subdivided, the peak amplitude of the first subdivision is used in estimating DMs. [4.3] The complete data that I collected from the four recordings that I will discuss are given in Appendix 3. Caution is often needed in interpreting this numerical information, since the values do not always reflect the listening experience accurately. Sometimes distinctions are so subtle that they are imperceptible under normal listening conditions, so it is important to keep the “just-noticeable differences” in mind. Ballpark figures for these are 5­10% for inter-onset intervals (IOIs) and 0.5–2.0 dB for intensities. (68) Also, both onset perception and intensity perception vary considerably in relation to pitch and timbre. (69) For example, listeners with normal hearing will hear tone x (100 Hz, 50 dBSPL) and tone y (1000 Hz, 20 dBSPL) as being equal in loudness despite their vast differences in amplitude. 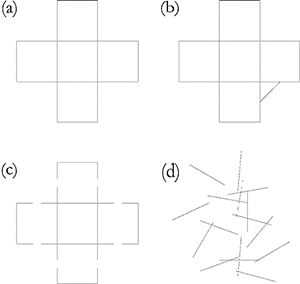 Researchers have not seemed to come up with a way to adjust for these perceptual considerations, possibly because of complexities that arise in dealing with multi-voice textures, pedaling, and the interactions of overtones. Also, perhaps most importantly, this type of performance analysis does not allow us to examine the intensities of individual voices, so it is sometimes tempting to misread an intensity analysis as a representation of melodic dynamics rather than the net dynamics of all voices combined. My interpretation of DMs will be based largely on the rankings of downbeat intensities relative to one another, not on absolute values, and, in general, I will draw attention only to those performance analysis statistics that seem most clearly to reflect and enhance the actual listening experience. [4.5] As I mentioned above (see paragraph 2.7), I will account for the irregularities in these metrical patterns by developing transformational rules that apply to MS abstractions. I will consider the eccentric hypermeasure in each version to be a transformation of an underlying regular hypermeasure. Superficially, it might seem that these transformations fracture the metrical structure at this level, resulting in a series of fragments that I will call metrical structure episodes (abbreviated MSEs). At level H1, I submit that the unity underlying each series of MSEs can be understood with little effort on the part of the listener. At deeper levels, however, an underlying unity cannot always be demonstrated. Nevertheless, in the interest of theorizing a rather subtle aspect of the listening experience, I think it is worthwhile to attempt to show the integrity of each independent MSE, rather than vaguely stating (as Lerdahl and Jackendoff do) that irregularities cause MS to become attenuated at deeper levels. Indeed, this approach allows us to trace in detail the gradual breakdown of MS from level to level. then a well-formed metrical structure episode M' can be formed by deleting B5, such that B1, B2, B3, B4, B6, B7, and B8 are adjacent beats at level Li and B1, B3, B6, and B8 are also beats at level Li+1. [4.7] In a performance that projects Interpretation A (Example 8a), the listener might at first perceive three MSEs in measures 1–23: a series of five duple hypermeasures (measures 1–10), followed by one triple hypermeasure (measures 11–13), followed by five more duple hypermeasures (measures 14–23). If Interpretation B (Example 8b) is projected, the listener would instead perceive three duple hypermeasures (measures 1–6), followed by one triple hypermeasure (measures 7–9), followed by seven duple hypermeasures (measures 10–23). In both cases, the listener might then intuitively reconceive the entire passage as a coherent sequence of eleven duple hypermeasures, as suggested by the Metrical Contraction rule (Example 9a–b). (72) That is not to say that the differences between the two performances will be ignored, but rather that the two performances will be understood as departing from the same underlying metrical structure in different ways. then a well-formed metrical structure episode M' can be formed by inserting beat Bx between beats B3 and B4, such that B1, B2, B3, Bx, B4, B5, and B6 are adjacent beats at level Li and B1, B3, B4, and B6 are also beats at level Li+1. [4.9] In all four recordings, strong and weak hyperbeats alternate regularly at level H1 in measures 1–10, and measure 20 has a strong accent, so I will focus on what happens in measures 11–20. The shift occurs earliest in Britten’s version through a succession of strong accents on the downbeats of both measure 13 and measure 14 (see Example 8c). The accent at 13.1 relative to 12.1 is achieved through a hesitation-style AM (in this case, an extension of IOI 12.2 by 14.8%) and a DM (an increase in net amplitude by 0.9 dB and three ranking points at the downbeat-to-downbeat level). (73) But 14.1 is stronger still (by nearly 4 dB and two ranking points), and 15.1 sounds softer than 14.1 despite the increase in orchestration. (The decrease in net amplitude is insignificant at 0.1 dB, but, in light of the expanded texture, the absence of an increase in amplitude supports a strong-weak hypermetric pattern in measures 14–15.) 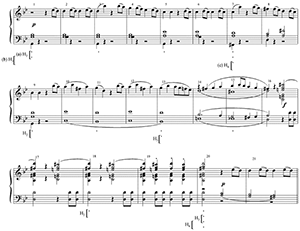 A diminuendo added by Britten through measure 15, an abrupt change in orchestration at 16.2, and an absence of clear AMs in these measures create some confusion, but the emphasis on even-numbered downbeats is confirmed in measures 17–20. IOI 18.1 has an elongation-style AM (9.2% longer than 17.1), and 19.1 is markedly softer than 18.1 as well (by a margin of 1.8 dB). To further reinforce the even-measure accents, 20.1 has an elongation-style AM (7.5%) and is the loudest beat in the entire excerpt, which seems especially dramatic in light of the absence of a crescendo in measure 19. The resulting pattern has adjacent strong beats at 13.1 and 14.1, indicative of a metrical truncation, so the passage can be thought of as containing two MSEs (measures 1–13 and 14–20), and a regular underlying pattern can be generated by applying the Metrical Completion rule (Example 10). [4.10] In contrast to Britten’s interpretation, Marriner preserves the odd-measure emphasis until the last possible moment, measures 19–20 (see Example 8d). In measures 10–20, this is projected extremely clearly through elongation-style agogic accents at 11.1, 13.1, 15.1, and 17.1 (by 20.0%, 10.9%, 9.4%, and 41.7%, respectively, at the downbeat level) as well as dynamic accents on these same beats (all of which have higher rankings than the even-measure downbeats that surround them). Indeed, 17.1 rather than 20.1 is the loudest downbeat in the excerpt. The arrival of even-measure accentuation at 20.1 seems to be associated mostly with the surface rhythm’s agogic accent, which is further enhanced with an elongation-style AM (6.4%). Note also that 19.1 is the first weak odd-measure downbeat in the excerpt; it is somewhat quieter than 18.1 (-1.7 dB) and about equal in length (IOI 19.1 is only 2 ms or 0.4% longer than 18.1, an imperceptible difference). The adjacent weak beats at 18.1 and 19.1 constitute a metrical expansion, and the pattern can be regularized through the application of the Metrical Contraction rule (Example 11). [4.11] Walter’s hypermetric interpretation is more complex than the preceding two, and this is largely because of clever ambiguities in his deployment of PMs (see Example 8e). The odd-measure strong beats established in measures 1–10 continue at least through measure 13. 11.1 is both longer (10.2%) and louder than 10.1, and the relation of 13.1 to 12.1 is similar (8.7% longer, 1.2 dB louder overall). (74) It is difficult to offer a hypermetric interpretation of measures 14–16, because the PMs play against the notated surface meter. Performers sometimes refer to this effect as a “negative accent” or “deflection,” and it occurs when a downbeat is considerably quieter than the listener would expect on the basis of the upbeat. (See the final column of Appendix 3c. These are the only downbeats in the entire excerpt that have negative changes in intensity at the beat-to-beat level.) Without a clear projection of surface meter, it is difficult to assess the location and strength of hypermetric accents. In the absence of evidence to the contrary, I would be inclined to hear a continuation of the odd-measure accents through to measure 16. It could be argued that the slight, though noticeable, acceleration into 15.1 supports this reading by giving that beat a special emphasis. (IOI 14.2 is shortened by 11.2%.) Next, two features conspire to encourage us hear a continuation of the odd-measure accents at 17.1: the sudden increase in dynamics and orchestration at 16.2 and the literal repetition of 16.2–17.1 in 17.2–18.1. All else being equal, 17.1–18.1 would most likely be heard as a strong-weak echo effect (Example 12a), a reading consistent with MPR 2. (75) Walter neither underlines nor contradicts this reading, however. The first three downbeats after 16.2 sound equal in loudness (0.4 dB difference), and despite some elongations that enhance the syncopation effect on the second beat of each measure, measures 17–19 sound steady. (All three downbeats are within 5% of the average tempo of the entire excerpt.) Thus, it could be argued that Walter leaves the hypermetric interpretation undefined in measures 17–19. There is, however, a salient accent at 20.1 (loudest downbeat IOI in the excerpt, 1.4 dB louder than 19.1), and in retrospect this might lead us to hear the entire cadential extension (measures 16–20) in the context of an even-measure hypermeter (Example 12b). At that point we would realize that our hunch that 17.1–18.1 was a strong-weak echo was incorrect. In that sense, the metric and hypermetric ambiguities of measures 14–19 (especially measures 17–19) in the Walter recording have a rather humorous effect, and one that adds richness to the listening experience. The reading shown in Example 12b (and in Example 8e) is the final version that emerges once the accent at 20.1 is heard. Walter’s interpretation includes a metrical expansion, this time in measures 15–17, so the pattern can be regularized through the Metrical Contraction rule (Example 12c). [4.13] So far I have been describing only the first level of hypermeter, that is, MS at the level of the double-measure. Lerdahl and Jackendoff suggest that a deeper level of hypermeter should include strong accents at 16.1 and 22.1, because these are points of harmonic arrival and might therefore be understood as structural accents. Stated in the terminology I have developed, this means that measures 16–21 form an MSE containing a three-beat hypermeasure plus a downbeat at level H2 (Example 14). Although Lerdahl and Jackendoff situate this six-bar episode at the “4-bar level,” implying that it is a transformation of two underlying two-bar MSEs, they do not clarify this transformation because they rightly consider it futile to attempt such a thing in music-notational terms and on the basis of the score alone. (77) Overall, Lerdahl and Jackendoff consider level H2, aside from this singular MSE, to be too ambiguous to explore, and they even go so far as to say, “The 4-bar level simply does not have much meaning for this passage.”(78) I would argue that, despite the ambiguity of the score, metrical organization across spans of four or even eight measures can be conveyed, at least episodically, in the performance of this excerpt. Owing to the instability caused by the erosion of regularity at these levels, the MS interpretation becomes increasingly dependent on salient PMs. (Here I am again invoking Lerdahl’s hypothesis that contextual salience becomes crucial to the construction of hierarchical structures when stability conditions are compromised. See paragraph 3.1 above.) Although the structures I am about to describe lie deep within the grey area between stability and instability, or between comprehensibility and incomprehensibility, I think they deserve some consideration. [4.16] The remaining three recordings evince more stable MSEs than Britten’s at the second and third hypermetric levels, and two of them (Marriner’s and Bernstein’s) include some tenable hypermetric transformations at the level H2. 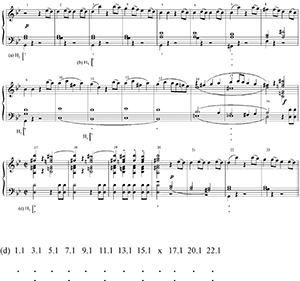 In Marriner’s recording, the first MSE continues through measure 16 (Example 17a). Up to measure 10, it projects the same metrical pattern as Britten’s recording (see Example 14), but in Marriner’s version the alternation of strong and weak hyperbeats continues through 15.1. In terms of overall intensity, IOI 11.1 is louder than 9.1 (+7.6 dB) and likewise IOI 15.1 is louder than 13.1 (+8.1 dB). The long crescendo in measures 12–15 adds further emphasis to 15.1, but it also obscures the relationship of 11.1 and 13.1 somewhat; nonetheless, 11.1 has a considerably longer elongation-style AM than 13.1 (35%, vs. 13%), so a strong-weak pattern is projected here. In Marriner’s recording, the first MSE is twice as long as in Britten’s recording, so we might expect that the third hypermetric level is somewhat more stable. Indeed, the hyperbeats at this level (i.e., 3.1, 7.1, 11.1, and 15.1) do evince a weak-strong-weak-strong pattern on the basis of their DMs (ranked sixth, fourth, seventh, and third, respectively, among odd-measure downbeats in measures 1–20). The resulting pattern can be interpreted as an upbeat, a full hypermeasure, and a downbeat (Example 17b). The first MSE ends at measure 16, because 17.1 is a strong beat (indeed, it has the loudest IOI in the excerpt) rather than the weak beat that we had come to expect. This strong beat belongs to another MSE at this level, which begins with a strong-weak-strong pattern among the next three hyperbeats, 17.1, 20.1, and 22.1 (Example 17c). As I mentioned above, the loudest downbeat in the passage is 17.1 in Marriner’s recording, and 22.1 is a strong beat at this level because of the structural accent articulated by the return of tonic harmony. (82) Because these metrical accents are caused by two different categories of accent cues, phenomenal and structural, it would be arbitrary to identify one as being stronger than the other, and furthermore I don’t think either alternative would have much intuitive appeal. For both these reasons, I think it would be artificial to propose a third level of hypermeter for this MSE. It does, however, seem possible to combine the two MSEs at the second level into a single MSE, since they are adjacent and each contains at least one full duple measure. Because there is a sequence of two strong beats at their border (i.e., 15.1 and 17.1), we must use the Metrical Completion rule in order to regularize this pattern (Example 17d). [4.17] Walter’s interpretation is arguably the most stable of the six under consideration. On first hearing, we might consider the first MSE at H2 to end in measure 10, as in Britten’s recording. A pattern of alternating weak and strong hyperbeats seems to be established through DMs in 1.1, 3.1, 5.1, 7.1, and 9.1 (ranked tenth, fifth, ninth, third, and eighth among the odd-measure downbeats in measures 1–20), and this pattern seems to be disrupted by the presence of another weak beat at 11.1 (5.4 dB quieter than IOI 13.1). If we consider 1.1 a strong beat, however, on the basis of its early position (see MPR 2), then a triple-meter pattern is established by measure 7, and this pattern continues uninterrupted through the entire excerpt (Example 18a). According to the latter interpretation, the first MSE of the piece ends at measure 21, because the structural accent at 22.1 would otherwise yield two adjacent strong beats (i.e., 20.1 and 22.1). The four strong beats in this MSE (1.1, 7.1, 13.1, and 20.1) are established as follows: 1.1 is strong because of its relatively early position (MPR 2); 7.1, because it is louder than the surrounding hyperbeats (5.1, 7.1, and 9.1 are ranked ninth, third, and eighth); 13.1, because it is louder than the preceding hyperbeat (+5.4 dB) and has a greater elongation-style AM than the ensuing one (15.9%, vs. 6.0%); and 20.1, because it is the loudest beat in the entire excerpt. On the basis of both DMs and AMs, beats 7.1 and 20.1 are the strongest of these four beats (1.1, 7.1, 13.1, and 20.1 rank twentieth, fifth, eighth, and first in loudness among the twenty downbeats in the excerpt, and IOI 7.1 has the most pronounced AM in the excerpt, an elongation of 30.4% over IOI 6.1.) This creates a weak-strong-weak-strong pattern at H3 (Example 18b). We might tentatively posit a fourth level here as well. It is difficult to choose between 7.1 and 20.1 on the basis of PMs, because 7.1 has the longest IOI in the excerpt and 20.1 the loudest. Nevertheless, the contrasts in texture, dynamics, and harmony that immediately follow 20.1 make it seem the more salient of the two beats, so an upbeat-downbeat figure seems to be the more defensible choice (Example 18c). As we found in both MSEs of Britten’s recording at level H3, the absence of a complete hypermeasure, combined with the extremely late position of the strong beat­this time at the downbeat of the twentieth measure out of twenty-one!­makes the H4 interpretation here extremely fragile. [4.18] As I mentioned previously, Bernstein’s interpretation is nearly identical to Marriner’s at level H1; they differ only in the nature of the transformation immediately preceding 20.1. As we shall see, however, the two interpretations diverge considerably at subsequent levels of MS. In Bernstein’s version, the first MSE continues only to measure 10, because (as in Britten’s recording) weak beats at level H2 are found at both 9.1 and 11.1. The five beats in this MSE (i.e., the odd-measure downbeats in measures 1–10) are differentiated in a way that should by now seem familiar, that is, through an alternation of relatively weak and relatively strong DMs (Example 19a). (Beats 1.1, 3.1, 5.1, 7.1, and 9.1 are ranked tenth, fifth, seventh, fourth, and ninth among the odd-measure downbeats in measures 1–20.) Of the two strong beats in this MSE, 7.1 is the stronger, for it has a more pronounced AM and DM than 3.1. (IOI 7.1 has 11.2% elongation at the beat level, vs. 5.9% in IOI 3.1, and the PSL in IOI 7.1 is 2.8 dB louder than in IOI 3.1). Thus, the first MSE has an upbeat-downbeat figure at H3, much like the one found in Britten’s recording (Example 19b). The weak beat at 11.1 initiates a second MSE (measures 11–21), which also has an alternation of weak and strong hyperbeats (Example 19c). The differentiation of 11.1 and 13.1 is clear on the basis of their DMs (ranked fourteenth and eighth among the downbeats in measures 1–20), as is the differentiation of 15.1, 17.1, 19.1, and 20.1 (ranked fifth, first, third, and second). Also note that, although IOI 13.1 is quieter than 15.1, the latter is less strongly delineated at the beat-to-beat level; whereas IOI 13.1 is louder than 12.2 (+1.0 dB), 15.1 is somewhat quieter than 14.2 (-0.8 dB). Among beats 13.1, 17.1, and 20.1, the three strong beats in the second MSE, the one with the loudest IOI is 17.1, so a weak-strong-weak pattern might be inferred at level H3 (Example 19d). [4.19] Both MSEs in Bernstein’s recording have duple meter at level H2, and two weak beats are adjacent at the border between the two. This interpretation can therefore be transformed to a regular, well-formed MSE spanning the entire excerpt through the Metrical Contraction rule (Example 20a). This transformation also yields a well-formed MSE at level H3, consisting of an upbeat and two full duple measures (Example 20b). Although these two hypermeasures are conceptually equal in length, the spans of the musical surface to which they correspond (i.e., measures 7–16 and 17–21) are radically different in length­they cover ten and five measures, respectively. (Incidentally, this progressive shortening is also evident at the level of the hyperbeats in these measures, which span six, four, three, and two measures.) This asymmetry might influence our choice between 7.1 and 17.1 at level H4. Beat 17.1 is clearly the louder of the two (by a margin of 13.2 dB), and it also has a salient hesitation-style AM (10.5% at the beat-to-beat level), while 7.1 has an elongation-style AM (11.2%). Although 17.1 would appear to be the stronger beat on the basis of these PM cues, this does not seem to be an intuitively justifiable reading. It seems that the extremely wide spacing of these hyperbeats diminishes the force of PM comparisons. Instead, 7.1 seems like the stronger beat (see Example 20c), and this reading is supported by the asymmetry between the portions of the musical surface corresponding to the two hyperbeats (see Appendix 3, MPR 5a) and also by the tendency to hear the earlier of two more-or-less equally accented beats as the strong beat (MPR 2). [4.20] As we have seen, each of the six interpretations under consideration employs a different set of hypermetric transformations and thus conveys a different version of the work. Some might find the diversity among these six interpretations unsettling, and might consider the absence of criteria for determining which is the “correct” or “intended” version to be a shortcoming of the procedure I have developed. To this objection, I would respond that, like the Gestalt theorists and like Lerdahl and Jackendoff, I am interested in understanding structural intuitions without recourse to idealism. In focusing on general principles of perception and on conventions for the projection of meter, I have attempted to sidestep the problematic metaphysical assumption that the work itself is timeless and fully determined prior to any performance of it, an assumption that is often implicit in critical discourse on the relative merits of different interpretations. Instead of imagining an ideal performance, I prefer to use hypothetical, metrically regular abstractions inferred from the interaction of score and performance as the framework for comparing interpretations. In order to use these comparisons to support an argument about the merit of a recording, we would need to postulate specific criteria for critical evaluation. For instance, if we decide that symmetry is important, then we might argue that Britten’s performance is outstanding because of the parallelism between the two MSEs in his version of the Mozart excerpt at levels H2 and H3 (see Examples 15 and 16). If we value musical humor, then we might instead prefer Walter’s interpretation, because of the thwarted expectancy at level H1 in his recording (see Example 12). While this approach to criticism might be interesting, it is important to realize that the comparisons enabled by my adaptations to the Lerdahl-Jackendoff theory are, in themselves, non-judgmental. [5.1] If Lerdahl and Jackendoff are correct in characterizing the Mozart example discussed in Part 4 as “a not untypically complex passage” with regard to Metrical Structure, then it would appear that their “balance-tipping” analogy, which I quoted previously (see paragraph 2.4), is in need of some refinement. The expression “tip the balance” implies that performance-specific features are considered relatively late in the analytic process, if at all, after an impasse is reached in the interpretation of a score. That is, in conducting an analysis, we first study the score, and in doing so we discover something that resembles the faces/vase illusion, so we then listen to a recording, and finally decide on a preferred reading. Because the Lerdahl-Jackendoff theory is intended first and foremost to depict the listener’s intuitions, I believe this sequence of events is inappropriate. By beginning with the details of performances in an ambiguous passage, I have shown that more than two different interpretations can be conveyed, and that these interpretations are not necessarily the ones that are the most obvious on the basis of the score. The potential multivalence of a musical structure is sometimes more extravagant than a score-reader can anticipate; some passages are more like mosaics than faces/vase illusions in the range of meanings they can evoke (see Example 1b, j). I therefore suggest that we begin our revision to the schematic representation of the “balance-tipping” model by extending the number of possible interpretations indefinitely (Example 21). [5.2] To me, the score-reader’s inability to predict a performer’s interpretation in no way indicates a lack of musical intuition, but instead reflects elite performers’ uncanny ability to avoid sounding predictable, an ability that involves a combination of intuition and conscious thought. GTTM goes a long way toward formalizing intuition, but it makes no allowance for the influence a performer’s unpredictable, conscious decisions can have on an experienced listener’s intuitions­indeed, Lerdahl and Jackendoff regard the performer’s construction of an interpretation as a “largely unconscious” process. (83) An influential study by psychologist Caroline Palmer provides a different perspective. 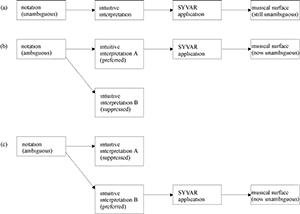 In a series of experiments on the performance of works with ambiguous phrase structures, Palmer examines correlations between pianists’ score annotations and SYVAR patterns that are conventionally used to communicate interpretations of phrase structure. (84) Each pianist’s annotations suggest a different structural interpretation, and that interpretation corresponds strongly and uniquely to SYVARs in that individual’s performance. Palmer’s experiment suggests a model of the relationship between ambiguous notation and the sounding musical surface (see Example 22a) that is quite different from, but not incompatible with, the model implied by Lerdahl and Jackendoff through their balance-tipping analogy (see Example 6b–c). Palmer’s model allows maximum room for the performer’s freedom of conscious interpretation, and thus it sheds light on exceptions to Lerdahl and Jackendoff’s assumption that performing nuance arises largely from unconscious interpretation. Thus, we might further revise our schematic representation of the balance-tipping phenomenon by adding conscious interpretation as an intermediate stage between the intuitive understanding of hierarchical structures and the application of SYVARs (Example 22b). A limited form of conscious thought (i.e., preference between two equally legitimate options) was already implicit in Example 4, but Palmer’s model allows us to expand this considerably to include whatever musical (and even extramusical) considerations seem relevant. [5.4] If GTTM were designed as a reading theory rather than a listening theory, or if the Mozart example possessed an exceptionally high degree of metrical complexity, then it might be argued that the scheme I am suggesting places too much emphasis on seemingly superficial performing nuances at the expense of more powerful score-based elements. I would answer this objection by reiterating three crucial facts: (1) the theory is clearly intended to capture the experienced listener’s intuitions, so the aural stimulus rather than the score is the more suitable object of inquiry, (2) Lerdahl and Jackendoff suggest that the Mozart example has an unexceptional degree of metrical complexity, and (3) elsewhere Lerdahl suggests that salience conditions become increasingly important to the listener’s construction of hierarchical interpretations in cases where stability is compromised, and in my view this should include violations to MWFR 4, the rule that insists on evenly spaced beats at the tactus and immediately larger metrical levels. I would also point out once again that, in simpler metrical situations that adhere to MWFR 4 at the first few levels of hypermeter, skilled performers and (other) readers should be expected to agree on their interpretations of the score. In the case of an unambiguous structure, therefore, the differences among performances become less relevant, and the score can adequately serve as an substitute for a conventional performance (see Example 6a). [5.5] I will conclude by mentioning a few ways in which the concepts I have discussed might be developed further. Under close examination, recordings of additional hypermetrically ambiguous passages would no doubt prompt refinements to the metrical transformation rules that I proposed in Part 4. The utility of the metrical transformation rules at the level of local meter might also be assessed, using examples from non-Western and twentieth-century repertories in which temporal organization lies in the grey area between the random and the perfectly regular (e.g., changing meters). It is also important to remember that Metrical Structure is one of four interdependent parameters of hierarchical organization theorized in GTTM, and it remains to be seen whether the metrical transformations I have described would have effects on the other parameters. (87) It might also be interesting to explore the effects of performing nuance within each of the other parameters of the theory. In particular, the projection of phrase-periodic structure and, more recently, the communication of patterns of musical tension in performance have been studied extensively by music psychologists, and this research would inform an examination of the role of performance in the communication of phrase-periodic structure and patterns of tension and relaxation, parameters that Lerdahl and Jackendoff cover under the rubric of Grouping Structure (GS) and Prolongational Reduction (PR), respectively. (88) The techniques for SYVAR analysis that I outline in Part 4 might also help in the development of analytical applications for the copious insights on performance that are found in more recent texts on meter, such as Jonathan Kramer’s The Time of Music, William Rothstein’s Phrase Rhythm in Tonal Music, and Christopher Hasty’s Meter as Rhythm. Indeed, any structuralist theory that purports to illuminate the listening experience should have room for considering the impact of performing nuance, and performance analysis seems especially useful in exploring the inner workings of ambiguous structures. Every attack point must be associated with a beat at the smallest metrical level present at that point in the piece. Every beat at a given level must also be a beat at all smaller levels present at that point in the piece. At each metrical level, strong beats are spaced either two or three beats apart. The tactus and immediately larger metrical levels must consist of beats equally spaced throughout the piece. At subtactus metrical levels, weak beats must be equally spaced between the surrounding strong beats. Where two or more groups or parts of groups can be construed as parallel, they preferably receive parallel metrical structure. Weakly prefer a metrical structure in which the strongest beat in a group appears relatively early in the group. Prefer a metrical structure in which beats of level Li that coincide with the inception of pitch-events are strong beats of Li. Prefer a metrical structure in which beats of level Li that are stressed are strong beats of Li. f. a relatively long duration of a harmony in the relevant levels of the time-span reduction(harmonic rhythm). Weakly prefer a metrical structure in which a relatively strong beat occurs immediately after a relatively long pitch-event. Prefer a metrically stable bass. Strongly prefer a metrical structure in which cadences are metrically stable; that is, strongly avoid violations of local preference rules within cadences. Strongly prefer a metrical structure in which a suspension is on a stronger beat than its resolution. Prefer a metrical analysis that minimizes conflict in the time-span reduction. Prefer metrical structures in which at each level every other beat is strong. (b) deleting B2 and all beats at all levels between B2 and B3 and associating B1 with the onset of T'. [7.1] Before I begin explaining some basic techniques for the analysis of duration and loudness in recordings, I must once again emphasize that the process should begin with close listening unmediated by a computer. This helps us avoid attributing importance to distinctions that are too fine for the ear to detect under normal listening conditions. [7.2] When a performer is present as an experimental subject, a computer interface with the instrument can allow the researcher to gather data very efficiently, but data collection is rather more arduous in the case of a recorded performance. At present, there are three basic options for the analysis of recordings: tapping software, spectrographic analysis, and audio editing software (sometimes referred to as waveform analysis). In the first of these approaches, the listener taps along with the perceived beat of the performance, from which the computer calculates rough data on tempo fluctuation. (91) This is the most efficient method for gathering data, and the only realistic method for analyzing complete large-scale works or movements or for making general comparisons of a large number of recordings. However, it is limited to the parameter of tempo, and even in this capacity it is considerably less accurate than the other forms of analysis. Spectrographic analysis, the second approach, is especially useful for gathering information on timbre. (92) This is the preferred method for dealing with orchestral instruments and the human voice (in both live and recorded performances), but it requires cumbersome (and expensive) hardware and a greater knowledge of acoustics and mathematics than many music theorists possess (including the present author). This leaves waveform analysis, in which excerpts from an LP or a CD are converted to digital sound files (e.g., .au or .wav) and analyzed with audio editing software. (93) This method is more accurate than the tapping approach and more user-friendly than the spectrographic, and it can provide reliable information pertaining to loudness and (especially) duration. [7.3] Once the excerpt has been converted to a sound file, its waveform can be displayed in an audio editing program, and playback can be initiated from any point, with a resolution greater than 1 ms (millisecond). (94) (I prefer Syntrillium CoolEdit, a Shareware program that I have found to be reliable and user-friendly. WaveLab and ProTools are other popular options.) Through a combination of visual and aural observation, one can identify the temporal location of the onset (beginning) of any event, such as a solid chord or an unaccompanied melody note. By using this method, the durations of inter-onset intervals (IOIs) can be calculated at the level of the phrase, measure, beat, or (in some cases) individual note. Some precision is lost in cases where reverb or chord asynchrony makes it difficult to pinpoint the onset, and human error should also be taken into consideration. If pressed, I would estimate the reliability to be no worse than ±20 ms. In general, I like to gather IOI statistics at the level of the tactus, that is, the metrical level that is most salient to the listener (and the performer) and that sometimes provokes toe-tapping. These values can easily be converted to M.M. speeds in beats per minute (bpm). [7.5] It is important to realize that two different scales are in common use among those interested in measuring the loudness of music. One is called “Sound Pressure Level” (SPL), and in this case the baseline (0 dB) represents the normal threshold of hearing (i.e., minimum audible intensity) for pitches around 1000 Hz. This scale is used for comparing sounds “in the air.” The other scale, “Electronic Signal Level” (ESL), instead uses the point at which distortion is attenuated as its baseline. The latter scale is used for most forms of electronically mediated sound, including audio editing software. Those who are accustomed to seeing amplitudes in terms of SPL scales, according to which most musical performances fall somewhere between 40 and 90 dB, might be surprised by the readings given by audio editing software, which (if distortion is successfully avoided) fall entirely below 0 dB. Most CD recordings, for example, have ESLs between ­90 dB and 0 dB. [7.6] It should also be noted that, unlike IOIs, absolute intensity values are meaningless in themselves as measures of a performance, because they are dependent upon recording and playback levels. (96) In performance analysis, it is best to concentrate on relative intensities within any given recording. The most useful approach that the current technology enables appears to be the ranking of selected events in terms of loudness. In order to maximize the effectiveness of this, the excerpt should be edited so that the loudest event is amplified to just under 0 dBESL and all other values are amplified proportionally. This process, which can be carried out automatically using the audio editor’s “Normalize” function, widens the range of amplitudes and thus facilitates comparisons. Even if we restrict ourselves to the ranking of relative intensities, caution is required in interpreting amplitude data, since the relationship between amplitude and perceived loudness is extremely complex. Intensity rises in proportion to frequency in the case of isolated pitches, and also in proportion to textural density,(97) so it would be simplistic to regard a quantitative change in intensity as a change in loudness. For this reason, it is safest to compare intensity levels in the case of events that are qualitatively similar in terms of parameters other than perceived loudness. Fortunately, significant changes in orchestration occur only three times in the excerpt used in this study (at beats 14.1, 16.2, and 20.2), and the frequency range is relatively small (e.g., the melody lies within the span of a tenth), but in music with a greater variety of orchestration or pitch, intensity values would be less useful measures of loudness, even for the purpose of ranking the dynamic levels of selected beats. [7.7] Audio editing software can automatically compute the peak sound level (PSL) within any portion of an audio file. (98) First, as I have just explained, the entire excerpt should be edited using the “Normalize” function. Next, the PSL data can be collected for any span of music. Depending on the objective, it might be appropriate to examine each beat (using the onset points located previously as guides), or even each note within passages whose dynamics or accents seem to be of particular interest. Unfortunately, existing technology does not allow us to analyze each voice in a multi-voice texture independently. It is possible to define frequency limits to the analysis (e.g., to analyze the amplitudes for frequencies between 40 Hz and 1000 Hz), but such an approach would discount the contribution of overtones to the perceived intensity of each pitch. In this and the following tables, TF = tempo fluctuation, a comparison between the local tempo and the average tempo. There is an interesting contrapuntal-temporal effect in this performance. In mm. 1-11, where the melody has a rest on the second beat of each odd-numbered measure, the bass articulates the beat later than expected, but nevertheless the ensuing melody note comes in "on time." Values shown are estimates of the virtual melody onset, an approximation based on the onsets of the second and fourth quarter-note subdivisions of these measures. The bass onsets for these beats are, respectively: 0.564, 2.956, 5.028, 7.283, 9.415, and 11.729 s. PSLs here are based on bass onsets, but IOIs are based on the virtual melody onsets. Numbers in parentheses indicate the paragraphs in which terms are introduced. * Catherine Nolan, Caroline Palmer, and the two anonymous reviewers deserve my special thanks for their helpful suggestions. Dr. Nolan provided encouragement and expert guidance throughout the project’s development, and Dr. Palmer offered thorough and unusually quick feedback on my references to studies in music psychology. Catherine Nolan, Caroline Palmer, and the two anonymous reviewers deserve my special thanks for their helpful suggestions. Dr. Nolan provided encouragement and expert guidance throughout the project’s development, and Dr. Palmer offered thorough and unusually quick feedback on my references to studies in music psychology. 1. See especially Jonathan Kramer, The Time of Music: New Meanings, New Temporalities, New Listening Strategies (New York: Schirmer, 1988), Chapter 4: “Meter and Rhythm,” 81–122; Christopher Hasty, Meter as Rhythm (Oxford: Oxford University Press, 1997), “Preface,” vii–xii. 3. Stanley Sadie, ed. The New Grove Dictionary of Music and Musicians, 2nd ed. (London: Macmillan, 2001), s.v. “Metre,” by Justin London. 4. See especially Mary Louise Serafine, Music as Cognition: The Development of Thought in Sound (New York: Columbia University Press, 1988), 69–74. 5. Joseph Kerman, Contemplating Music: Challenges to Musicology (Cambridge, Mass. : Harvard University Press, 1985), 60–112; Clare Detels, “Autonomist/Formalist Aesthetics, Music Theory, and the Feminist Paradigm of Soft Boundaries,” Journal of Aesthetics and Art Criticism 52/1 (Winter 1994): 113–26; Kevin Korsyn, “Beyond Privileged Contexts: Intertextuality, Influence, and Dialogue,” in Rethinking Music, ed. Nicholas Cook and Mark Everist, 55–72 (Oxford: Oxford University Press, 1999); Susanne Cusick, “Gender, Musicology, and Feminism,” also in Rethinking Music, 471–98. 6. Fred Lerdahl and Ray Jackendoff, A Generative Theory of Tonal Music (Cambridge, Mass. : MIT Press, 1983). I will use the abbreviation GTTM in subsequent references to this source. 7. Empirical confirmation of claims from GTTM can be found in Irène Deliège, “Grouping Conditions in Listening to Music: An Approach to Lerdahl and Jackendoff’s Grouping Preference Rules,” Music Perception 4/4 (Summer 1987): 325–60; Emmanuel Bigand, “Abstraction of Two Forms of Underlying Structure in a Tonal Melody,” Psychology of Music 18 (1990): 45–59; Nicola Dibben, “The Cognitive Reality of Hierarchic Structure in Tonal and Atonal Music,” Music Perception 12/1 (Fall 1994): 1–25. 8. GTTM has been cited widely in the psychological literature on performance since the mid-1980s. See, e.g., Neil P. Todd, “A Model of Expressive Timing in Tonal Music,” Music Perception 3/1 (Fall 1985): 33–58; Eric F. Clarke, “Generative Principles in Music Performance,” in Generative Processes in Music: The Psychology of Performance, Improvisation, and Composition, ed. John A. Sloboda, 1–26 (Oxford: Clarendon, 1988); Caroline Palmer, “Mapping Musical Thought to Musical Performance,” Journal of Experimental Psychology: Human Perception and Performance 15 (1989): 331–46; W. Luke Windsor and Eric F. Clarke, “Expressive Timing and Dynamics in Real and Artificial Musical Performances: Using an Algorithm as an Analytic Tool,” Music Perception 15/2 (Winter 1997): 127–52. 9. See especially GTTM, Chapter 1, “Theoretical Perspective,” 1–12; Lerdahl and Jackendoff, “A Reply to Peel and Slawson’s Review of A Generative Theory of Tonal Music,” Journal of Music Theory 29 (1985): 145–60; Lerdahl, “Composing and Listening: A Reply to Nattiez,” in Perception and Cognition of Music, ed. Irène Deliège and John A. Sloboda, 421–28 (Hove, U.K.: Psychology Press, 1997). 10. GTTM, 1. Emphasis added. 11. They admit, for example, that their theory fails to consider counterpoint (GTTM, 37). 12. The term is derived from “hypermeasure,” coined by Edward T. Cone in Musical Form and Musical Performance (New York: Norton, 1968), 40. I will also use the term “hyperbeat” to designate a beat that belongs to a hypermeasure. 13. Among the most influential sources in this genre are Erwin Stein, Form and Performance (New York: Knopf, 1962); Cone, Musical Form and Musical Performance; Janet Schmalfeldt, “On the Relation of Analysis to Performance: Beethoven’s Bagatelles Op. 126, Nos. 2 and 5,” Journal of Music Theory 29 (1985): 1–31; Wallace Berry, Musical Structure and Performance (New Haven: Yale University Press, 1989). See also the extensive bibliography in Cynthia Folio, “Analysis and Performance of the Flute Sonatas of J. S. Bach: A Sample Lesson Plan,” Journal of Music Theory Pedagogy 5 (1991): 133–59. Some more recent contributions include Joel Lester, “Performance and Analysis: Interaction and Interpretation,” in The Practice of Performance: Studies in Musical Interpretation, ed. John Rink, 197–216 (Cambridge: Cambridge University Press, 1995); Catherine Nolan, “Reflections on the Relationship of Analysis and Performance,” College Music Symposium 32–34 (1993–94): 112–39; Richard S. Parks, “Structure and Performance: Metric and Phrase Ambiguities in the Three Chamber Sonatas,” in Debussy in Performance, ed. James R. Briscoe, 193–224 (New Haven: Yale University Press, 1999). 14. Nicholas Cook, “Analyzing Performance, and Performing Analysis,” in Rethinking Music, ed. Nicholas Cook and Mark Everist, 239–61 (Oxford: Oxford University Press, 1999). 15. J. L. Austin, How to Do Things with Words (Cambridge, Mass. : Harvard University Press, 1962), 3, 6. 16. Cook, “Analyzing Performance, and Performing Analysis,” 239–47; Tim Howell, “Analysis and Performance: The Search for a Middleground,” in Companion to Contemporary Musical Thought, ed. John Paynter, Tim Howell, Richard Orton, and Peter Seymour, 692–714 (London: Routledge, 1992), 709; Lawrence Rosenwald, “Theory, Text-Setting, and Performance,” Journal of Musicology 11 (1993), 60–63. 17. Lester, “Performance and Analysis,” 199–202. 18. Foremost in this category are Heinrich Schenker’s views on performance. See, e.g., the final sentence of Schenker, “The Sarabande of Bach’s Suite No. 3 for Solo Violoncello [BWV 1009],” trans. Hedi Siegel, in The Masterwork in Music: A Yearbook, Vol. 2 (1926), ed. William Drabkin, 55–58 (Cambridge: Cambridge University Press, 1996), 58: “Any other interpretation and execution will surely founder, for the immutable forces that govern this sarabande do not admit an arbitrary interpretation of any part of the composition.” See also Schenker, The Art of Performance, ed. Heribert Esser, trans. Irene Schreier Scott (Oxford: Oxford University Press, 2000), 3–4, 53–57, 77–78. 19. See, e.g., Susanne Cusick, “Gender and the Cultural Work of a Classical Music Performance,” repercussions 3/1 (Spring 1994), 105–7. 20. I prefer the expression “reading from the score” to both “analyzing the piece,” which is vague, and “score-based analysis,” which overemphasizes the visual aspect of the activity. Whether we are dealing with words or music, the word “reading” carries the connotations of aural imagery and creative participation in an often silent, private performance of sorts. In a subtle way, the word “reading” emphasizes the analyst’s participation in the construction of the object of study. As Nicholas Cook once remarked, “when musicians use the notation for the purposes it is intended for—when, that is, they read it—they supply a great deal of information which is not actually in the score.” Nicholas Cook, A Guide to Musical Analysis (London: Dent, 1987), 227. 21. Nicholas Cook, “Between Process and Product: Music and/as Performance,” Music Theory Online 7/2 (April 2001). 22. José A. Bowen has also developed a framework for comparing different realizations of scores, but he concentrates on historical traditions and trends in performance, such as the convention of slowing down for the second theme of a work in sonata-allegro form, as well as the ontological significance of these trends, rather than the perception of structural elements. See Bowen, “The History of Remembered Innovation: Tradition and Its Role in the Relationship between Musical Works and Their Performances,” Journal of Musicology 11/2 (Spring 1993): 139–73; idem, “Finding the Music in Musicology,” in Rethinking Music, ed. Nicholas Cook and Mark Everist, 424–51 (Oxford: Oxford University Press, 1999). 23. For insights on these types of ambiguities and associated ontological problems, see the following: Leo Treitler, “History and the Ontology of the Work,” Journal of Aesthetics and Art Criticism 15/3 (Summer 1993): 483–97; Bowen, “History of Remembered Innovation”; Nicholas Cook, “At the Borders of Musical Identity: Schenker, Corelli, and the Graces,” Music Analysis 18/2 (July 1999): 179–233. 24. I will address the latter issue in some detail in a paper entitled “Rethinking Schenker’s Musical Ontology through Gadamer’s Critique of Aesthetic Consciousness,” scheduled for presentation at “The Intellectual Frontiers of Music,” University of Aberdeen, June 25, 2002. 25. On the connection of ontology and performance, see Treitler, “History and the Ontology of the Work”; Bowen, “The History of Remembered Innovation”; and Cook, “At the Borders of Musical Identity.” See also Peter Johnson, “Play School,” The Musical Times (June 1995): 275–77, and the ensuing, rather heated scholarly exchange between Jonathan Dunsby and Peter Johnson, The Musical Times (January 1997): 12–17, (August 1997): 4–11, (October 1997): 2, (January 1998): 2. Much has also been written on this subject by Anglo-American philosophers specializing in aesthetics. See especially Peter Kivy, Authenticities: Philosophical Reflections on Musical Performance (Ithaca: Cornell University Press, 1995); Lydia Goehr, “Conflicting Ideals of Performance Perfection in an Imperfect Practice,” in The Quest for Voice: On Music, Politics, and the Limits of Philosophy, 132–73 (Berkeley: University of California Press, 1998). 26. Early research on Gestalt phenomena, including the work of Christian von Ehrenfels and Alexius Meinong, was largely speculative. The Berlin school (consisting of Max Wertheimer, Kurt Koffka, and Wolfgang Köhler, all of whom were students of Carl Stumpf) is generally regarded to have initiated Gestalt psychology as a scientific movement, but nevertheless shared the earlier scholars’ interest in aesthetics. Gestalt psychology is second only to transformational linguistics in its influence on GTTM. 27. Mitchell G. Ash, Gestalt Psychology in German Culture, 1890–1967: Holism and the Quest for Objectivity (Cambridge: Cambridge University Press, 1995), 1. 28. Max Wertheimer, “Untersuchungen zur Lehre von der Gestalt, I,” Psychologische Forschung 1 (1922): 47–58, condensed and translated as “The General Theoretical Situation,” in A Source Book of Gestalt Psychology, ed. and trans. Willis D. Ellis, 12–16 (New York: Humanities Press, 1967). 29. Kurt Koffka, Principles of Gestalt Psychology (London: Routledge and Kegan Paul, 1935), 110, 171. See also Wertheimer, “Untersuchungen zur Lehre von der Gestalt, II,” Psychologische Forschung 4 (1923): 301–50. 31. P. Kruse and M. Stadler, eds., Ambiguity in Mind and Nature: Multistable Cognitive Phenomena (Berlin: Springer Verlag, 1995): (a) 58, (f) 9, (g) 8. (d–e): Koffka, Principles of Gestalt Psychology, 195. 32. See L. H. Shaffer, “Timing in Solo and Duet Piano Performances,” Quarterly Journal of Experimental Psychology 36A (1984): 577–95; Alf Gabrielsson, “The Performance of Music,” in The Psychology of Music, 2nd ed., ed. Diana Deutsch, 501–602 (San Diego: Academic Press, 1999). 33. An index of acronyms is included as Appendix 4. 34. Lerdahl and Jackendoff were among the first theorists to describe beats not as sounding events, but instead as points in time inferred from the acoustic signal. See GTTM, 18; Kramer, The Time of Music, 82, 97. 35. GTTM, 28. The annotations indicating metric and hypermetric levels are mine. 36. Noam Chomsky, Syntactic Structures (The Hague: Mouton, 1957). 39. For a review of this controversy, see Sadie, ed., The New Grove, 2nd ed., s.v. “Rhythm: Current Rhythm Research,” by Justin London. 40. GTTM, 24, annotated with beat labels in the form “measure.beat”. 41. These two readings are informed by Andrew Imbrie, “‘Extra’ Measures and Metrical Ambiguity in Beethoven,” in Beethoven Studies, ed. Alan Tyson (New York: Norton, 1973), 45–66. Imbrie uses the terms “conservative” and “radical,” respectively, for these types of hypermetric shifts. 43. The depth and regularity of hypermeter are controversial issues. Jonathan Kramer, for example, argues that irregularities involving the addition or deletion of weak beats need not cause hypermeter to be attenuated. See Kramer, The Time of Music, 98–102. 44. George Hartmann proposed that “eidotropy” is a better translation of the word “Prägnanz,” as it was used by the Gestalt theorists, than “precision.” Eidotropy is the tendency of an image or representation to become typical or conventional. See Hartmann, Gestalt Psychology: A Survey of Facts and Principles (New York: The Ronald Press, 1935), 48. 46. Transformation plays a much larger role in generative linguistics than in GTTM. The distinction is touched upon in GTTM, 62. 47. See especially GTTM, 60–61. 48. Leonard Bernstein, The Unanswered Question: Six Talks at Harvard (Cambridge, Mass. : Harvard University Press, 1976), 95–97. 49. Leonard Bernstein, adaptation of Mozart, Symphony No. 40 in G Minor, K. 550, first movement, measures 1–24, in Leonard Bernstein at Harvard: The Norton Lectures, vol. 2: “Musical Syntax,” side 3 (issued New York: CBS Masterworks BL 33019, 1974), LP vinyl recording. 50. See Caroline Palmer and Carol L. Krumhansl, “Mental Representations for Musical Meter,” Journal of Experimental Psychology: Human Perception and Performance 16/4 (November 1990): 729–41. Further support for the notion that metrical memory is distinct from pitch memory may be found in the following sources: D. J. Povel and P. Essens, “Perception of Temporal Patterns,” Music Perception 2 (1985): 411–40; C. Palmer and C. Q. Pfordresher, “From My Head to Your Ear: The Faces of Meter in Performance and Perception,” in Proceedings of the Sixth International Conference on Music Perception and Cognition, ed. C. Woods, et al., 1–9 (Keele, U.K.: Keele University, 2000). 51. Jonathan Kramer uses the terms “extension” and “contraction” for these processes. Kramer, The Time of Music, 102–3. 52. See, e.g., Lerdahl and Jackendoff, “Reply to Peel and Slawson,” 158–9: “The issue in any case is not one of value but of how listeners organize musical surfaces.” See also Lerdahl, “Cognitive Constraints on Compositional Systems,” in Generative Processes in Music, ed. Sloboda, 231–59. 53. More recently, a consensus has emerged that formalism can be divorced from idealism by considering the latter to be nothing more than a useful fiction. This postmodern ideology has sometimes been referred to as “provisional autonomy.” For a passionate defense of it, see Leo Treitler, “The Historiography of Music: Issues of Past and Present,” in Rethinking Music, ed. Nicholas Cook and Mark Everist, 356–77 (Oxford: Oxford University Press, 1999), 358. 54. I do not mean to imply that Gestalt psychology is free of ideological baggage, but merely that it successfully evades the influence of neo-Platonic idealism and the aesthetic tradition associated with it. Indeed, the view that perceptual experience can be explained independently of socio-historical factors is itself the product of a specifically modernist socio-historical milieu. See Mitchell G. Ash, “The Academic Environment and the Establishment of Experimental Psychology,” in Gestalt Psychology in German Culture, 1890–1967: Holism and the Quest for Objectivity, 17–27 (Cambridge: Cambridge University Press, 1995). 55. In his influential publications in the 1930s, music psychologist Carl E. Seashore conceived performance expression as departures from a mechanically regular norm. See Seashore, Psychology of Music (New York: McGraw-Hill, 1938), 29–30. This approach was later taken up at Uppsala by Ingmar Bengtsson and his colleagues, who coined the term SYVAR. See Ingmar Bengtsson and Alf Gabrielsson, “Analysis and Synthesis of Musical Rhythm,” in Studies of Music Performance, ed. Johann Sundberg, 27–59 (Stockholm: Royal Swedish Academy of Music, 1983). 56. In this paper, I am adhering to Lerdahl and Jackendoff’s policy of theorizing aspects of comprehensibility rather than aesthetics. See GTTM, 7–8, as well as paragraph 5.3, below. 57. I do not mean to suggest that performances are entirely unambiguous in meaning, or that performers never introduce additional ambiguities by their ironic handling of structures that seem unequivocal on the basis of the score. Intriguing as such phenomena may be, I will instead focus on situations in which performing nuances seem to eliminate, or at least mitigate, some of the ambiguities found in scores. 58. Lerdahl, “Atonal Prolongational Structure,” Contemporary Music Review 4 (1989), 73. See also GTTM, 108–9, for a preliminary discussion of the need to distinguish between structural importance and surface salience. 64. Sloboda found six types of cues that accounted for 82% of the statistically significant differences in performers’ treatment of alternate metrical renderings of a melody. These are summarized in Sloboda, “Expressive Skill in Two Pianists,” 290–91. Sloboda used a metronome in his experiment, which might account for the relatively insignificant appearance of AMs in his study. Clarke did not use a metronome, and perhaps consequently, his study reveals more convincing results pertaining to AMs. See especially Clarke, “Generative Principles,” 11–14. It would seem that a further implication of Sloboda’s and Clarke’s studies is that Lerdahl and Jackendoff’s omission of time signatures and barlines from their analyses of MS is an unnecessary precaution. If the performer uses PM cues that lie within the listener’s scope of experience, then the performance essentially makes the time signatures and barlines audible. The only type of performance that corresponds to their unmeasured notation would be a computer-generated mechanically regular performance. 65. Listeners vary greatly in their ability to decipher performers’ metrical cues, including DMs and AMs, but these differences appear to be proportionate to the extent of listeners’ musical experience. See Sloboda, “The Communication of Musical Metre,” 393. 66. Compare nos. 3 and 5 under the “General Discussion” in Sloboda, “Expressive Skill in Two Pianists,” 290. Also compare nos. 2 and 3 under the discussion of expressive timing in Clarke, “Generative Principles,” 19. 67. GTTM, 348. See also  Appendix 1. 68. A. R. Halpern and C. I. Darwin, “Duration Discrimination in a Series of Rhythmic Events,” Perception and Psychophysics 31/1 (1982): 86–89; E. Zwicker and H. Fastl, “Just-Noticeable Sound Changes,” in Psychoacoustics: Facts and Models, 2nd ed., 175–201 (Berlin: Springer-Verlag, 1999), 175–6. 69. See J. Vos and R. A. Rasch, “The Perceptual Onset of Musical Tones,” Perception and Psychophysics 29 (1981): 323–35; Bruno H. Repp, “Patterns of Note Onset Asynchronies in Expressive Piano Performance,” Journal of the Acoustical Society of America 100/6 (December 1996): 3917; Scott D. Lipscomb and Donald Hodges, “Hearing and Music Perception,” in Handbook of Music Psychology, ed. Donald Hodges, 83–132 (San Antonio, Tex. : IMR Press, 1996), 113. 70. English Chamber Orchestra conducted by Benjamin Britten (recorded Snape, U.K., May 1968; issued London: Decca 430 494–2, 1991), compact disc recording; Academy of St. Martin-in-the-Fields conducted by Neville Marriner (recorded London [ca. 1970]; issued [n.p. ]: Philips 6500 162, ; reissued Netherlands: Philips 422 610–2, ), compact disc recording; Columbia Symphony Orchestra conducted by Bruno Walter (issued New York: Columbia MS 6869, ), LP vinyl recording; Vienna Philharmonic Orchestra conducted by Leonard Bernstein (recorded 1984; issued Hamburg: Deutsche Grammophon 413 776–2, 1984), compact disc recording. I will refer to these recordings as Mozart/Britten, Mozart/Marriner, Mozart/Walter, and Mozart/Bernstein. 71. Note that both this rule and the rule for metrical completion given in paragraph 4.8 apply specifically to duple-meter contexts. Further transformational rules could readily be constructed to account for similar phenomena in the context of a prevailing triple meter. According to Lerdahl and Jackendoff’s MWFR3, duple and triple meter are the only allowable well-formed metrical structures in Western tonal music. 72. See also paragraph 2.7, above. Like the authors of GTTM, I will refrain from speculating on the temporality of the cognitive process of metrical transformation. For a preliminary exploration of real-time cognitive processing of music, informed by research on listeners’ parsing of language, see Ray Jackendoff, “Musical Parsing and Musical Affect,” Music Perception 9/2 (Winter 1991): 199–230. 73. See Appendix 2 for an explanation of the terms I use in reference to the quantitative performance analyses. 74. According to the amplitude statistics, IOI 10.1 is louder than 11.1, although the difference (0.24 dB) lies below the threshold of discrimination. This discrepancy can be attributed to the fact that amplitude stats fail to differentiate between the contributions of the melody and accompaniment. In this case, the lower strings seem to be playing measure 10 more intensely than measure 11, probably because of local harmonic tension and resolution. I would argue that the salient DM in the melody is more relevant to a discussion of Walter’s MS interpretation. The accent at 13.1 also seems to be confounded by this effect. 75. See also MPR 2 (GTTM, 347), included in my Appendix 1. 76. Actually, 11.1 is a full 2.6 dB quieter than 10.1, but this reflects only the net intensity, not the melodic accent. Sloboda and Clarke don’t propose timbre-related PMs, no doubt largely because their subjects were pianists and the piano timbre cannot normally be controlled independently of dynamic level. Sloboda and Clarke also describe substitutions such as these. They identify some SYVARs in different parameters of performance that project the same aspect of a metrical interpretation. See especially Clarke, “Generative Principles,” 14; Sloboda, “The Communication of Musical Metre,” 394; and Sloboda, “Expressive Skill in Two Pianists,” 292. 79. Again, the intensity data here can be a bit misleading. In all voices combined, 5.1 is louder than 3.1 by a margin of 0.8 dB, but this measure does not capture melodic accents. 80. GTTM, 347. See also Appendix 1. 81. Also note that this interpretation conflicts with the score-based interpretation offered by Lerdahl and Jackendoff (my Example 14 [DjVu] [GIF]), in which 20.1 and presumably 14.1 are considered weak beats. While my interpretation of Britten’s recording is based mainly on phenomenal accents, Lerdahl and Jackendoff’s interpretation of the score is based on the effect of the structural accents articulated by the arrival of dominant and tonic harmonies at measures 16 and 20, respectively. Because of the relative obscurity of this hypermetrical level after measure 10, I would speculate that the choice between these two possible MSE interpretations for this recording of the piece will depend on whether the listener happens to be attending more closely to harmonic cues or to PMs. As explained in the passage from GTTM quoted above (paragraph 3.2), both phenomenal and structural accents can serve as cues for the construction of metrical accents. See also GTTM, 30–35. 82. Note that this MSE comes very close to the one mentioned by Lerdahl and Jackendoff. Marriner’s first hyperbeat occurs a measure later than the one shown in Example 14 [DjVu] [GIF], however, and a transformation at level H1 makes the MSE a two-beat rather than a three-beat hypermeasure at level H2. 84. Palmer, “Mapping Musical Thought,” refers to the principles summarized in Clarke, “Generative Principles,” but neither adopts nor refutes Clarke’s idea of considering GTTM an “input” to the generation of a performance. Note also that Palmer does not explore the pianists’ hypermetric interpretation, so the relationship between her findings and my study is rather tangential. Nevertheless, Palmer clearly demonstrates a situation where the performer’s conscious intentions have a marked effect on the perception of an ambiguous structure. 85. See Noam Chomsky, Aspects of the Theory of Syntax (Cambridge, Mass. : MIT Press, 1965), 4. 86. I should also mention that, although Lerdahl and Jackendoff attempt to transpose the “competence/performance” dichotomy directly to music and to address only competence in their theory, it should by now be clear that a sharp distinction between the terms of this dichotomy is somewhat unconvinving in the case of music (or, for that matter, any performing art). For example, musical competence includes, in addition to the factors addressed in GTTM, an understanding of performers’ SYVARs, and conversely musical performance often involves the clarification of ambiguous musical structures. A full exploration of this problem, which goes much further than nomenclature, would, no doubt, require a separate article. 87. GTTM, 10; Lerdahl and Jackendoff, “Reply to Peel and Slawson,” 147. 88. See especially Palmer, “Mapping Musical Thought”; William E. Frederickson and Christopher M. Johnson, “The Effect of Performer Use of Rubato on Listener Perception of Tension in Mozart,” Psychomusicology 15 (1996): 78–86. Lerdahl’s more recent work on pitch space, which is closely related to Prolongational Reduction, is widely discussed in Music Perception 13/3 (Spring 1996), a special issue on musical tension that includes much fodder for further performance-related research. 89. This appendix includes all the rules pertaining to MS in the Rules Index of GTTM. See GTTM, 347–48. Also included are the new preference rules and transformational rules that I am proposing, with paragraph references. 90. Lerdahl and Jackendoff claim that all their MS rules except MWFR3 and MWFR4 apply to all musical traditions. Note that I have made no such claims with regard to the performance-related rules, all of which I consider to be specific to the Western art-music tradition. 91. For example, José A. Bowen, “A Computer-Aided Study of Conducting,” Computing in Musicology 9 (1993–94): 93–103. 92. For example, Peter Johnson, “Performance and the Listening Experience: Bach’s ‘Erbarme Dich,’” in Theory Into Practice: Composition, Performance, and the Listening Experience, ed. Nicholas Cook, Peter Johnson, and Hans Zender, 68–84 (Leuven, Belgium: Leuven University Press, 1999). 93. For example, Christopher M. Johnson, “The Performance of Mozart: A Study of Rhythmic Timing by Skilled Musicians,” Psychomusicology 15 (1996), 90. 94. My methodology for analyzing expressive timing is based that of Bruno H. Repp. See his “A Microcosm of Musical Expression: I. Quantitative Analysis of Pianists’ Timing in the Initial Measures of Chopin’s Etude in E Major,” Journal of the Acoustical Society of America 104/2, part 1 (August 1998), 1087. 95. Lipscomb and Hodges, “Hearing and Music Perception,” 114. 96. Bruno H. Repp, “A Microcosm of Musical Expression: II. Quantitative Analysis of Pianists’ Dynamics in the Initial Measures of Chopin’s Etude in E Major,” Journal of the Acoustical Society of America 105/3 (March 1999), 1974. 97. Caroline Palmer and Judith C. Brown, “Investigation in the Amplitude of Sounded Piano Tones,” Journal of the Acoustical Society of America 90/1 (1991): 60–66. 98. My methodology is similar to Bruno Repp’s, though perhaps less sophisticated. See Repp, “Microcosm of Musical Expression: II,” 1973–74. See especially Jonathan Kramer, The Time of Music: New Meanings, New Temporalities, New Listening Strategies (New York: Schirmer, 1988), Chapter 4: “Meter and Rhythm,” 81–122; Christopher Hasty, Meter as Rhythm (Oxford: Oxford University Press, 1997), “Preface,” vii–xii. Stanley Sadie, ed. The New Grove Dictionary of Music and Musicians, 2nd ed. (London: Macmillan, 2001), s.v. “Metre,” by Justin London. See especially Mary Louise Serafine, Music as Cognition: The Development of Thought in Sound (New York: Columbia University Press, 1988), 69–74. Joseph Kerman, Contemplating Music: Challenges to Musicology (Cambridge, Mass. : Harvard University Press, 1985), 60–112; Clare Detels, “Autonomist/Formalist Aesthetics, Music Theory, and the Feminist Paradigm of Soft Boundaries,” Journal of Aesthetics and Art Criticism 52/1 (Winter 1994): 113–26; Kevin Korsyn, “Beyond Privileged Contexts: Intertextuality, Influence, and Dialogue,” in Rethinking Music, ed. Nicholas Cook and Mark Everist, 55–72 (Oxford: Oxford University Press, 1999); Susanne Cusick, “Gender, Musicology, and Feminism,” also in Rethinking Music, 471–98. Fred Lerdahl and Ray Jackendoff, A Generative Theory of Tonal Music (Cambridge, Mass. : MIT Press, 1983). I will use the abbreviation GTTM in subsequent references to this source. Empirical confirmation of claims from GTTM can be found in Irène Deliège, “Grouping Conditions in Listening to Music: An Approach to Lerdahl and Jackendoff’s Grouping Preference Rules,” Music Perception 4/4 (Summer 1987): 325–60; Emmanuel Bigand, “Abstraction of Two Forms of Underlying Structure in a Tonal Melody,” Psychology of Music 18 (1990): 45–59; Nicola Dibben, “The Cognitive Reality of Hierarchic Structure in Tonal and Atonal Music,” Music Perception 12/1 (Fall 1994): 1–25. GTTM has been cited widely in the psychological literature on performance since the mid-1980s. 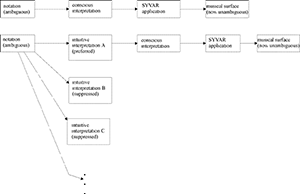 See, e.g., Neil P. Todd, “A Model of Expressive Timing in Tonal Music,” Music Perception 3/1 (Fall 1985): 33–58; Eric F. Clarke, “Generative Principles in Music Performance,” in Generative Processes in Music: The Psychology of Performance, Improvisation, and Composition, ed. John A. Sloboda, 1–26 (Oxford: Clarendon, 1988); Caroline Palmer, “Mapping Musical Thought to Musical Performance,” Journal of Experimental Psychology: Human Perception and Performance 15 (1989): 331–46; W. Luke Windsor and Eric F. Clarke, “Expressive Timing and Dynamics in Real and Artificial Musical Performances: Using an Algorithm as an Analytic Tool,” Music Perception 15/2 (Winter 1997): 127–52. See especially GTTM, Chapter 1, “Theoretical Perspective,” 1–12; Lerdahl and Jackendoff, “A Reply to Peel and Slawson’s Review of A Generative Theory of Tonal Music,” Journal of Music Theory 29 (1985): 145–60; Lerdahl, “Composing and Listening: A Reply to Nattiez,” in Perception and Cognition of Music, ed. Irène Deliège and John A. Sloboda, 421–28 (Hove, U.K.: Psychology Press, 1997). They admit, for example, that their theory fails to consider counterpoint (GTTM, 37). The term is derived from “hypermeasure,” coined by Edward T. Cone in Musical Form and Musical Performance (New York: Norton, 1968), 40. I will also use the term “hyperbeat” to designate a beat that belongs to a hypermeasure. Among the most influential sources in this genre are Erwin Stein, Form and Performance (New York: Knopf, 1962); Cone, Musical Form and Musical Performance; Janet Schmalfeldt, “On the Relation of Analysis to Performance: Beethoven’s Bagatelles Op. 126, Nos. 2 and 5,” Journal of Music Theory 29 (1985): 1–31; Wallace Berry, Musical Structure and Performance (New Haven: Yale University Press, 1989). See also the extensive bibliography in Cynthia Folio, “Analysis and Performance of the Flute Sonatas of J. S. Bach: A Sample Lesson Plan,” Journal of Music Theory Pedagogy 5 (1991): 133–59. Some more recent contributions include Joel Lester, “Performance and Analysis: Interaction and Interpretation,” in The Practice of Performance: Studies in Musical Interpretation, ed. John Rink, 197–216 (Cambridge: Cambridge University Press, 1995); Catherine Nolan, “Reflections on the Relationship of Analysis and Performance,” College Music Symposium 32–34 (1993–94): 112–39; Richard S. Parks, “Structure and Performance: Metric and Phrase Ambiguities in the Three Chamber Sonatas,” in Debussy in Performance, ed. James R. Briscoe, 193–224 (New Haven: Yale University Press, 1999). Nicholas Cook, “Analyzing Performance, and Performing Analysis,” in Rethinking Music, ed. Nicholas Cook and Mark Everist, 239–61 (Oxford: Oxford University Press, 1999). J. L. Austin, How to Do Things with Words (Cambridge, Mass. : Harvard University Press, 1962), 3, 6. Cook, “Analyzing Performance, and Performing Analysis,” 239–47; Tim Howell, “Analysis and Performance: The Search for a Middleground,” in Companion to Contemporary Musical Thought, ed. John Paynter, Tim Howell, Richard Orton, and Peter Seymour, 692–714 (London: Routledge, 1992), 709; Lawrence Rosenwald, “Theory, Text-Setting, and Performance,” Journal of Musicology 11 (1993), 60–63. Lester, “Performance and Analysis,” 199–202. Foremost in this category are Heinrich Schenker’s views on performance. See, e.g., the final sentence of Schenker, “The Sarabande of Bach’s Suite No. 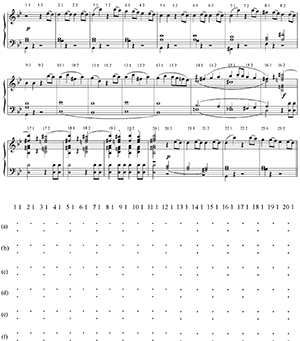 3 for Solo Violoncello [BWV 1009],” trans. Hedi Siegel, in The Masterwork in Music: A Yearbook, Vol. 2 (1926), ed. William Drabkin, 55–58 (Cambridge: Cambridge University Press, 1996), 58: “Any other interpretation and execution will surely founder, for the immutable forces that govern this sarabande do not admit an arbitrary interpretation of any part of the composition.” See also Schenker, The Art of Performance, ed. Heribert Esser, trans. Irene Schreier Scott (Oxford: Oxford University Press, 2000), 3–4, 53–57, 77–78. See, e.g., Susanne Cusick, “Gender and the Cultural Work of a Classical Music Performance,” repercussions 3/1 (Spring 1994), 105–7. I prefer the expression “reading from the score” to both “analyzing the piece,” which is vague, and “score-based analysis,” which overemphasizes the visual aspect of the activity. Whether we are dealing with words or music, the word “reading” carries the connotations of aural imagery and creative participation in an often silent, private performance of sorts. In a subtle way, the word “reading” emphasizes the analyst’s participation in the construction of the object of study. As Nicholas Cook once remarked, “when musicians use the notation for the purposes it is intended for—when, that is, they read it—they supply a great deal of information which is not actually in the score.” Nicholas Cook, A Guide to Musical Analysis (London: Dent, 1987), 227. Nicholas Cook, “Between Process and Product: Music and/as Performance,” Music Theory Online 7/2 (April 2001). José A. Bowen has also developed a framework for comparing different realizations of scores, but he concentrates on historical traditions and trends in performance, such as the convention of slowing down for the second theme of a work in sonata-allegro form, as well as the ontological significance of these trends, rather than the perception of structural elements. See Bowen, “The History of Remembered Innovation: Tradition and Its Role in the Relationship between Musical Works and Their Performances,” Journal of Musicology 11/2 (Spring 1993): 139–73; idem, “Finding the Music in Musicology,” in Rethinking Music, ed. Nicholas Cook and Mark Everist, 424–51 (Oxford: Oxford University Press, 1999). For insights on these types of ambiguities and associated ontological problems, see the following: Leo Treitler, “History and the Ontology of the Work,” Journal of Aesthetics and Art Criticism 15/3 (Summer 1993): 483–97; Bowen, “History of Remembered Innovation”; Nicholas Cook, “At the Borders of Musical Identity: Schenker, Corelli, and the Graces,” Music Analysis 18/2 (July 1999): 179–233. I will address the latter issue in some detail in a paper entitled “Rethinking Schenker’s Musical Ontology through Gadamer’s Critique of Aesthetic Consciousness,” scheduled for presentation at “The Intellectual Frontiers of Music,” University of Aberdeen, June 25, 2002. On the connection of ontology and performance, see Treitler, “History and the Ontology of the Work”; Bowen, “The History of Remembered Innovation”; and Cook, “At the Borders of Musical Identity.” See also Peter Johnson, “Play School,” The Musical Times (June 1995): 275–77, and the ensuing, rather heated scholarly exchange between Jonathan Dunsby and Peter Johnson, The Musical Times (January 1997): 12–17, (August 1997): 4–11, (October 1997): 2, (January 1998): 2. Much has also been written on this subject by Anglo-American philosophers specializing in aesthetics. See especially Peter Kivy, Authenticities: Philosophical Reflections on Musical Performance (Ithaca: Cornell University Press, 1995); Lydia Goehr, “Conflicting Ideals of Performance Perfection in an Imperfect Practice,” in The Quest for Voice: On Music, Politics, and the Limits of Philosophy, 132–73 (Berkeley: University of California Press, 1998). Early research on Gestalt phenomena, including the work of Christian von Ehrenfels and Alexius Meinong, was largely speculative. The Berlin school (consisting of Max Wertheimer, Kurt Koffka, and Wolfgang Köhler, all of whom were students of Carl Stumpf) is generally regarded to have initiated Gestalt psychology as a scientific movement, but nevertheless shared the earlier scholars’ interest in aesthetics. Gestalt psychology is second only to transformational linguistics in its influence on GTTM. Mitchell G. Ash, Gestalt Psychology in German Culture, 1890–1967: Holism and the Quest for Objectivity (Cambridge: Cambridge University Press, 1995), 1. Max Wertheimer, “Untersuchungen zur Lehre von der Gestalt, I,” Psychologische Forschung 1 (1922): 47–58, condensed and translated as “The General Theoretical Situation,” in A Source Book of Gestalt Psychology, ed. and trans. Willis D. Ellis, 12–16 (New York: Humanities Press, 1967). Kurt Koffka, Principles of Gestalt Psychology (London: Routledge and Kegan Paul, 1935), 110, 171. See also Wertheimer, “Untersuchungen zur Lehre von der Gestalt, II,” Psychologische Forschung 4 (1923): 301–50. P. Kruse and M. Stadler, eds., Ambiguity in Mind and Nature: Multistable Cognitive Phenomena (Berlin: Springer Verlag, 1995): (a) 58, (f) 9, (g) 8. (d–e): Koffka, Principles of Gestalt Psychology, 195. See L. H. Shaffer, “Timing in Solo and Duet Piano Performances,” Quarterly Journal of Experimental Psychology 36A (1984): 577–95; Alf Gabrielsson, “The Performance of Music,” in The Psychology of Music, 2nd ed., ed. Diana Deutsch, 501–602 (San Diego: Academic Press, 1999). An index of acronyms is included as Appendix 4. Lerdahl and Jackendoff were among the first theorists to describe beats not as sounding events, but instead as points in time inferred from the acoustic signal. See GTTM, 18; Kramer, The Time of Music, 82, 97. GTTM, 28. The annotations indicating metric and hypermetric levels are mine. Noam Chomsky, Syntactic Structures (The Hague: Mouton, 1957). For a review of this controversy, see Sadie, ed., The New Grove, 2nd ed., s.v. “Rhythm: Current Rhythm Research,” by Justin London. GTTM, 24, annotated with beat labels in the form “measure.beat”. These two readings are informed by Andrew Imbrie, “‘Extra’ Measures and Metrical Ambiguity in Beethoven,” in Beethoven Studies, ed. Alan Tyson (New York: Norton, 1973), 45–66. Imbrie uses the terms “conservative” and “radical,” respectively, for these types of hypermetric shifts. The depth and regularity of hypermeter are controversial issues. Jonathan Kramer, for example, argues that irregularities involving the addition or deletion of weak beats need not cause hypermeter to be attenuated. See Kramer, The Time of Music, 98–102. George Hartmann proposed that “eidotropy” is a better translation of the word “Prägnanz,” as it was used by the Gestalt theorists, than “precision.” Eidotropy is the tendency of an image or representation to become typical or conventional. See Hartmann, Gestalt Psychology: A Survey of Facts and Principles (New York: The Ronald Press, 1935), 48. Transformation plays a much larger role in generative linguistics than in GTTM. The distinction is touched upon in GTTM, 62. Leonard Bernstein, The Unanswered Question: Six Talks at Harvard (Cambridge, Mass. : Harvard University Press, 1976), 95–97. Leonard Bernstein, adaptation of Mozart, Symphony No. 40 in G Minor, K. 550, first movement, measures 1–24, in Leonard Bernstein at Harvard: The Norton Lectures, vol. 2: “Musical Syntax,” side 3 (issued New York: CBS Masterworks BL 33019, 1974), LP vinyl recording. See Caroline Palmer and Carol L. Krumhansl, “Mental Representations for Musical Meter,” Journal of Experimental Psychology: Human Perception and Performance 16/4 (November 1990): 729–41. Further support for the notion that metrical memory is distinct from pitch memory may be found in the following sources: D. J. Povel and P. Essens, “Perception of Temporal Patterns,” Music Perception 2 (1985): 411–40; C. Palmer and C. Q. Pfordresher, “From My Head to Your Ear: The Faces of Meter in Performance and Perception,” in Proceedings of the Sixth International Conference on Music Perception and Cognition, ed. C. Woods, et al., 1–9 (Keele, U.K.: Keele University, 2000). Jonathan Kramer uses the terms “extension” and “contraction” for these processes. Kramer, The Time of Music, 102–3. See, e.g., Lerdahl and Jackendoff, “Reply to Peel and Slawson,” 158–9: “The issue in any case is not one of value but of how listeners organize musical surfaces.” See also Lerdahl, “Cognitive Constraints on Compositional Systems,” in Generative Processes in Music, ed. Sloboda, 231–59. More recently, a consensus has emerged that formalism can be divorced from idealism by considering the latter to be nothing more than a useful fiction. This postmodern ideology has sometimes been referred to as “provisional autonomy.” For a passionate defense of it, see Leo Treitler, “The Historiography of Music: Issues of Past and Present,” in Rethinking Music, ed. Nicholas Cook and Mark Everist, 356–77 (Oxford: Oxford University Press, 1999), 358. I do not mean to imply that Gestalt psychology is free of ideological baggage, but merely that it successfully evades the influence of neo-Platonic idealism and the aesthetic tradition associated with it. Indeed, the view that perceptual experience can be explained independently of socio-historical factors is itself the product of a specifically modernist socio-historical milieu. See Mitchell G. Ash, “The Academic Environment and the Establishment of Experimental Psychology,” in Gestalt Psychology in German Culture, 1890–1967: Holism and the Quest for Objectivity, 17–27 (Cambridge: Cambridge University Press, 1995). In his influential publications in the 1930s, music psychologist Carl E. Seashore conceived performance expression as departures from a mechanically regular norm. See Seashore, Psychology of Music (New York: McGraw-Hill, 1938), 29–30. This approach was later taken up at Uppsala by Ingmar Bengtsson and his colleagues, who coined the term SYVAR. See Ingmar Bengtsson and Alf Gabrielsson, “Analysis and Synthesis of Musical Rhythm,” in Studies of Music Performance, ed. Johann Sundberg, 27–59 (Stockholm: Royal Swedish Academy of Music, 1983). In this paper, I am adhering to Lerdahl and Jackendoff’s policy of theorizing aspects of comprehensibility rather than aesthetics. See GTTM, 7–8, as well as paragraph 5.3, below. I do not mean to suggest that performances are entirely unambiguous in meaning, or that performers never introduce additional ambiguities by their ironic handling of structures that seem unequivocal on the basis of the score. Intriguing as such phenomena may be, I will instead focus on situations in which performing nuances seem to eliminate, or at least mitigate, some of the ambiguities found in scores. Lerdahl, “Atonal Prolongational Structure,” Contemporary Music Review 4 (1989), 73. See also GTTM, 108–9, for a preliminary discussion of the need to distinguish between structural importance and surface salience. Sloboda found six types of cues that accounted for 82% of the statistically significant differences in performers’ treatment of alternate metrical renderings of a melody. These are summarized in Sloboda, “Expressive Skill in Two Pianists,” 290–91. Sloboda used a metronome in his experiment, which might account for the relatively insignificant appearance of AMs in his study. Clarke did not use a metronome, and perhaps consequently, his study reveals more convincing results pertaining to AMs. See especially Clarke, “Generative Principles,” 11–14. It would seem that a further implication of Sloboda’s and Clarke’s studies is that Lerdahl and Jackendoff’s omission of time signatures and barlines from their analyses of MS is an unnecessary precaution. If the performer uses PM cues that lie within the listener’s scope of experience, then the performance essentially makes the time signatures and barlines audible. The only type of performance that corresponds to their unmeasured notation would be a computer-generated mechanically regular performance. Listeners vary greatly in their ability to decipher performers’ metrical cues, including DMs and AMs, but these differences appear to be proportionate to the extent of listeners’ musical experience. See Sloboda, “The Communication of Musical Metre,” 393. Compare nos. 3 and 5 under the “General Discussion” in Sloboda, “Expressive Skill in Two Pianists,” 290. Also compare nos. 2 and 3 under the discussion of expressive timing in Clarke, “Generative Principles,” 19. GTTM, 348. See also  Appendix 1. A. R. Halpern and C. I. Darwin, “Duration Discrimination in a Series of Rhythmic Events,” Perception and Psychophysics 31/1 (1982): 86–89; E. Zwicker and H. Fastl, “Just-Noticeable Sound Changes,” in Psychoacoustics: Facts and Models, 2nd ed., 175–201 (Berlin: Springer-Verlag, 1999), 175–6. See J. Vos and R. A. Rasch, “The Perceptual Onset of Musical Tones,” Perception and Psychophysics 29 (1981): 323–35; Bruno H. Repp, “Patterns of Note Onset Asynchronies in Expressive Piano Performance,” Journal of the Acoustical Society of America 100/6 (December 1996): 3917; Scott D. Lipscomb and Donald Hodges, “Hearing and Music Perception,” in Handbook of Music Psychology, ed. Donald Hodges, 83–132 (San Antonio, Tex. : IMR Press, 1996), 113. English Chamber Orchestra conducted by Benjamin Britten (recorded Snape, U.K., May 1968; issued London: Decca 430 494–2, 1991), compact disc recording; Academy of St. Martin-in-the-Fields conducted by Neville Marriner (recorded London [ca. 1970]; issued [n.p. ]: Philips 6500 162, ; reissued Netherlands: Philips 422 610–2, ), compact disc recording; Columbia Symphony Orchestra conducted by Bruno Walter (issued New York: Columbia MS 6869, ), LP vinyl recording; Vienna Philharmonic Orchestra conducted by Leonard Bernstein (recorded 1984; issued Hamburg: Deutsche Grammophon 413 776–2, 1984), compact disc recording. I will refer to these recordings as Mozart/Britten, Mozart/Marriner, Mozart/Walter, and Mozart/Bernstein. Note that both this rule and the rule for metrical completion given in paragraph 4.8 apply specifically to duple-meter contexts. Further transformational rules could readily be constructed to account for similar phenomena in the context of a prevailing triple meter. According to Lerdahl and Jackendoff’s MWFR3, duple and triple meter are the only allowable well-formed metrical structures in Western tonal music. See also paragraph 2.7, above. Like the authors of GTTM, I will refrain from speculating on the temporality of the cognitive process of metrical transformation. For a preliminary exploration of real-time cognitive processing of music, informed by research on listeners’ parsing of language, see Ray Jackendoff, “Musical Parsing and Musical Affect,” Music Perception 9/2 (Winter 1991): 199–230. See Appendix 2 for an explanation of the terms I use in reference to the quantitative performance analyses. According to the amplitude statistics, IOI 10.1 is louder than 11.1, although the difference (0.24 dB) lies below the threshold of discrimination. This discrepancy can be attributed to the fact that amplitude stats fail to differentiate between the contributions of the melody and accompaniment. In this case, the lower strings seem to be playing measure 10 more intensely than measure 11, probably because of local harmonic tension and resolution. I would argue that the salient DM in the melody is more relevant to a discussion of Walter’s MS interpretation. The accent at 13.1 also seems to be confounded by this effect. See also MPR 2 (GTTM, 347), included in my Appendix 1. Actually, 11.1 is a full 2.6 dB quieter than 10.1, but this reflects only the net intensity, not the melodic accent. Sloboda and Clarke don’t propose timbre-related PMs, no doubt largely because their subjects were pianists and the piano timbre cannot normally be controlled independently of dynamic level. Sloboda and Clarke also describe substitutions such as these. They identify some SYVARs in different parameters of performance that project the same aspect of a metrical interpretation. See especially Clarke, “Generative Principles,” 14; Sloboda, “The Communication of Musical Metre,” 394; and Sloboda, “Expressive Skill in Two Pianists,” 292. Again, the intensity data here can be a bit misleading. In all voices combined, 5.1 is louder than 3.1 by a margin of 0.8 dB, but this measure does not capture melodic accents. GTTM, 347. See also Appendix 1. Also note that this interpretation conflicts with the score-based interpretation offered by Lerdahl and Jackendoff (my Example 14 [DjVu] [GIF]), in which 20.1 and presumably 14.1 are considered weak beats. While my interpretation of Britten’s recording is based mainly on phenomenal accents, Lerdahl and Jackendoff’s interpretation of the score is based on the effect of the structural accents articulated by the arrival of dominant and tonic harmonies at measures 16 and 20, respectively. Because of the relative obscurity of this hypermetrical level after measure 10, I would speculate that the choice between these two possible MSE interpretations for this recording of the piece will depend on whether the listener happens to be attending more closely to harmonic cues or to PMs. As explained in the passage from GTTM quoted above (paragraph 3.2), both phenomenal and structural accents can serve as cues for the construction of metrical accents. See also GTTM, 30–35. Note that this MSE comes very close to the one mentioned by Lerdahl and Jackendoff. Marriner’s first hyperbeat occurs a measure later than the one shown in Example 14 [DjVu] [GIF], however, and a transformation at level H1 makes the MSE a two-beat rather than a three-beat hypermeasure at level H2. Palmer, “Mapping Musical Thought,” refers to the principles summarized in Clarke, “Generative Principles,” but neither adopts nor refutes Clarke’s idea of considering GTTM an “input” to the generation of a performance. Note also that Palmer does not explore the pianists’ hypermetric interpretation, so the relationship between her findings and my study is rather tangential. Nevertheless, Palmer clearly demonstrates a situation where the performer’s conscious intentions have a marked effect on the perception of an ambiguous structure. See Noam Chomsky, Aspects of the Theory of Syntax (Cambridge, Mass. : MIT Press, 1965), 4. I should also mention that, although Lerdahl and Jackendoff attempt to transpose the “competence/performance” dichotomy directly to music and to address only competence in their theory, it should by now be clear that a sharp distinction between the terms of this dichotomy is somewhat unconvinving in the case of music (or, for that matter, any performing art). For example, musical competence includes, in addition to the factors addressed in GTTM, an understanding of performers’ SYVARs, and conversely musical performance often involves the clarification of ambiguous musical structures. A full exploration of this problem, which goes much further than nomenclature, would, no doubt, require a separate article. GTTM, 10; Lerdahl and Jackendoff, “Reply to Peel and Slawson,” 147. See especially Palmer, “Mapping Musical Thought”; William E. Frederickson and Christopher M. Johnson, “The Effect of Performer Use of Rubato on Listener Perception of Tension in Mozart,” Psychomusicology 15 (1996): 78–86. Lerdahl’s more recent work on pitch space, which is closely related to Prolongational Reduction, is widely discussed in Music Perception 13/3 (Spring 1996), a special issue on musical tension that includes much fodder for further performance-related research. This appendix includes all the rules pertaining to MS in the Rules Index of GTTM. See GTTM, 347–48. Also included are the new preference rules and transformational rules that I am proposing, with paragraph references. Lerdahl and Jackendoff claim that all their MS rules except MWFR3 and MWFR4 apply to all musical traditions. Note that I have made no such claims with regard to the performance-related rules, all of which I consider to be specific to the Western art-music tradition. For example, José A. Bowen, “A Computer-Aided Study of Conducting,” Computing in Musicology 9 (1993–94): 93–103. For example, Peter Johnson, “Performance and the Listening Experience: Bach’s ‘Erbarme Dich,’” in Theory Into Practice: Composition, Performance, and the Listening Experience, ed. Nicholas Cook, Peter Johnson, and Hans Zender, 68–84 (Leuven, Belgium: Leuven University Press, 1999). For example, Christopher M. Johnson, “The Performance of Mozart: A Study of Rhythmic Timing by Skilled Musicians,” Psychomusicology 15 (1996), 90. My methodology for analyzing expressive timing is based that of Bruno H. Repp. See his “A Microcosm of Musical Expression: I. Quantitative Analysis of Pianists’ Timing in the Initial Measures of Chopin’s Etude in E Major,” Journal of the Acoustical Society of America 104/2, part 1 (August 1998), 1087. Lipscomb and Hodges, “Hearing and Music Perception,” 114. Bruno H. Repp, “A Microcosm of Musical Expression: II. Quantitative Analysis of Pianists’ Dynamics in the Initial Measures of Chopin’s Etude in E Major,” Journal of the Acoustical Society of America 105/3 (March 1999), 1974. Caroline Palmer and Judith C. Brown, “Investigation in the Amplitude of Sounded Piano Tones,” Journal of the Acoustical Society of America 90/1 (1991): 60–66. My methodology is similar to Bruno Repp’s, though perhaps less sophisticated. See Repp, “Microcosm of Musical Expression: II,” 1973–74.